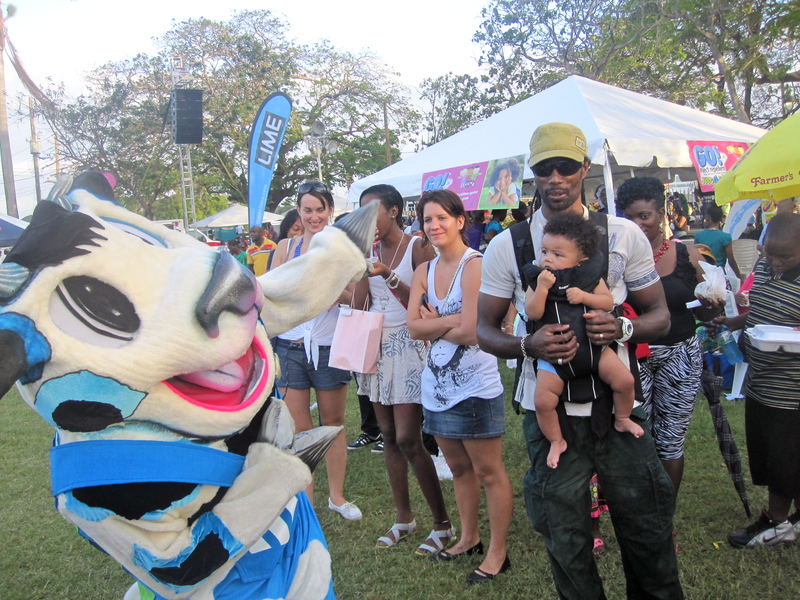 Lyndon’s Journal | A Shark, a Mermaid and a Minnow. This page is inspired by my Grandma, Lyndon’s Great Grandma or GG as we have started to affectionately call her. She has kept a five-year diary for as long as I can remember and has this uncanny ability to recall events, people, even the weather from years past. Something I have always found remarkable. 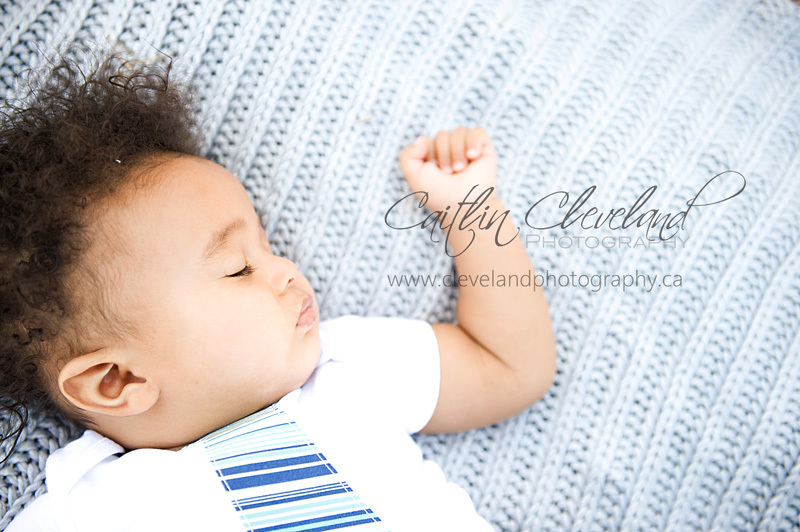 Here I hope to capture small snapshots in time as my baby grows – ones that will trigger memories for years to come. 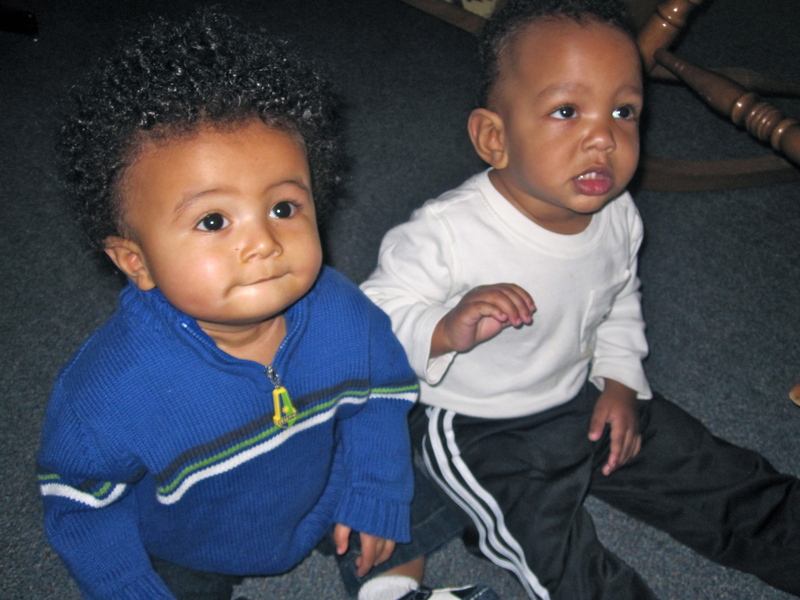 June 12, 2011 – Today was Noah’s birthday party. His Mommy and Daddy put on an awesome party. It was at the lake and Daddy came with us for a change. He got to meet all my friends. We had a fantastic time! Mommy let me get dirty much to Daddy’s dismay. He is even more of a worry wart than my Mommy. I crawled everywhere I could go and ate watermelon like it was going out of style. The highlight of the day was a kiss from Lily. 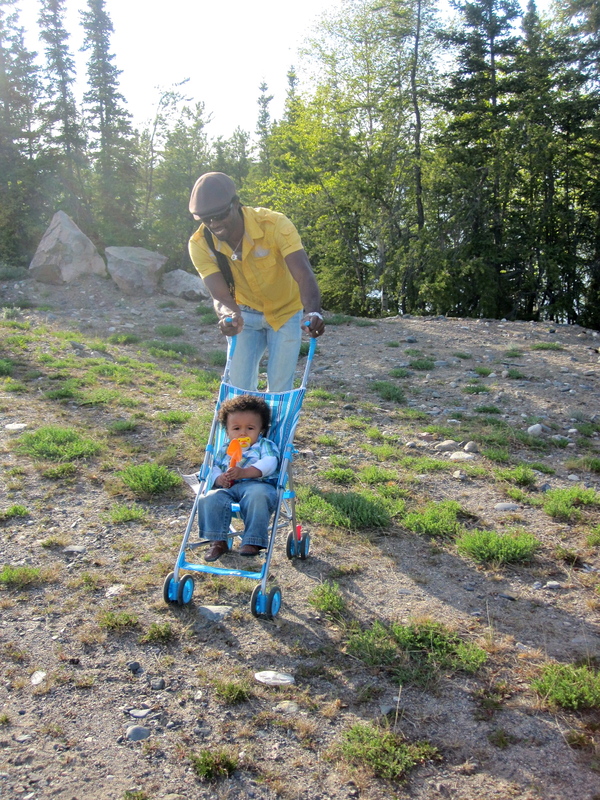 Daddy took me offroading in my umbrella stroller over the rocks on the way back to the car. So fun! It is now almost midnight and I am still going strong. I am trying to pull the dog’s tail at this very moment. I am like a teenager – up all night, sleep all day. Mommy hoped the fresh air and excitement would tire me out. No such luck. June 11, 2011 – Mommy went garage saling this morning so Daddy was on duty. We had some quality guy time. He likes to play cars with me. It is different than Mommy because she likes to read books and sing songs. Don’t tell her, but she is the worst singer I know. I still laugh though so I won’t hurt her feelings. We went for a walk in the afternoon because it was so sunny outside and I refused to have a nap. The fresh air won the battle. It didn’t take long for me to get my snore on. Jazzerdoodle was excited to go for an extra long outing. Later in the day, we hung out with our neighbors in the yard. We are going to miss them terribly when we move. June 10, 2011 – I had lunch at the Explorer Restaurant with my Grandma. She gave me french fries for the first time. Mommy was fretting that I was going to mess up my outfit but I didn’t care, neither did Grandma. We get along pretty good. I sat in my chair munching down my food like a champ . If I could talk, I would have told Mommy that I had to try out my new tooth. Grandma wanted to feel my it but I’m getting tired of fingers in my mouth, so I bit her. Then off for my Friday playdate at the park with my buddies. June 9, 2011 – My first new tooth appeared today. Daddy discovered it while we were watching television tonight. Mommy and Daddy got so excited, you’d think it was made out of gold. It’s about time though. This drooling business is getting a little old. I have also decided that I need to be on my feet all the time. I still look like a drunken sailor but it won’t be long before my legs get stronger. 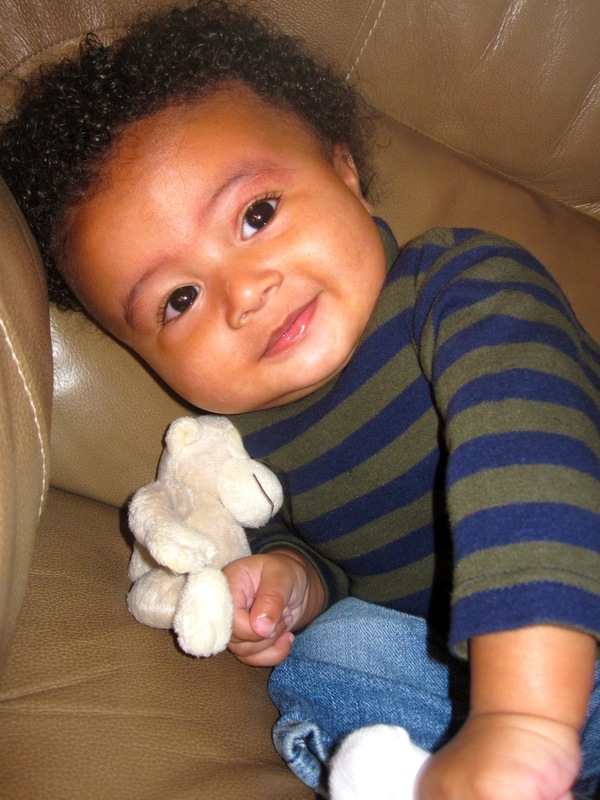 June 8, 2011 – Mommy thinks it is funny that I point my fake remote control at the television and press the buttons. She forgets that I watch every little move. I weigh 22lbs now. June 7, 2011 – Went to the park with my friends in the afternoon. May 23 – June 2, 2011 – Mommy, Daddy and I flew to Edmonton to do some shopping for our new house. I like shopping but I am more excited to see my family. Grandpa plays a mean game of peek-a-b00. Great Grandma gives the best loves. She let me play with her old keyboard and some cool boy toys. GG even babysit me for an afternoon. I wasn’t on my best behavior but she still loves me. 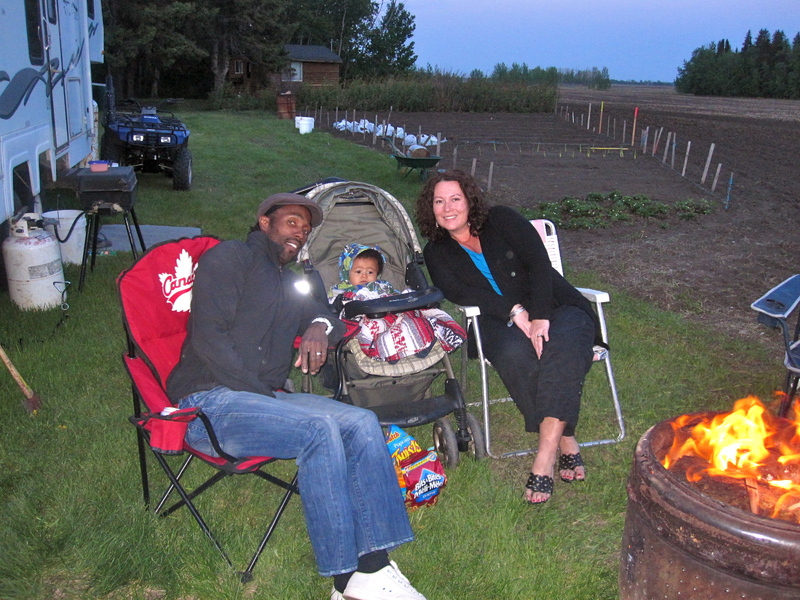 I also experienced my first campfire at the farm with Uncle Keith, Auntie Peggy, Cousin Sandra, Kyle, Mommy and Daddy. I even took my Grandpa out for an early Father’s Day rib dinner. I chewed on the bones and was in heaven. Oh so yummy! As for the shopping part, the only good part for me was riding like a big boy in the shopping carts and getting a rocking pair of red converse shoes. Oh, and of course, everyone stopping to say how cute I am. Mommy and Daddy bought lots of stuff – cabinets, laminate, counter tops, doors, lights, dining table, appliances, ect. This house project has taken over our lives. Grandpa is a bit of a hero right now as he taking four to six weeks to help with renovations. Not sure what I think of living out of a suitcase for that long….??? 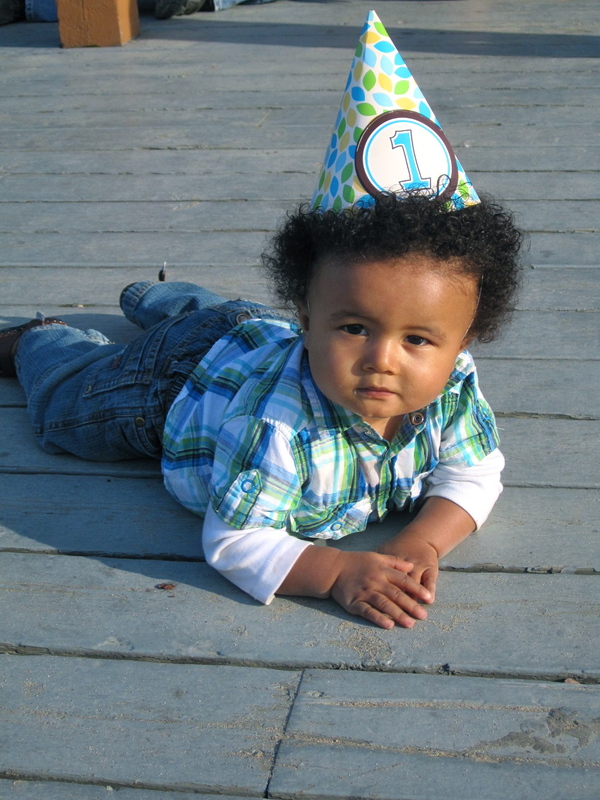 May 22, 2011 – Today was Jahmiah’s first birthday party. It was a teddy bear picnic and lots of fun. 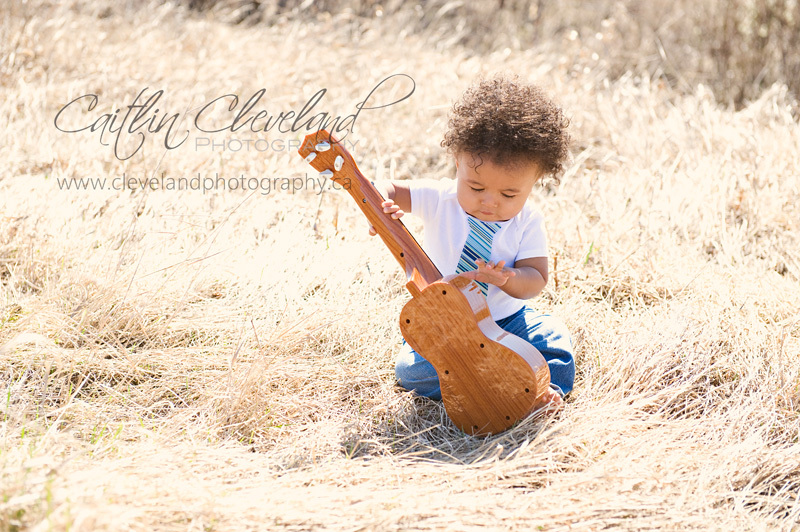 I bought him some wooden musical instruments. Maybe we’ll have the youngest ever reggae band? I tried all kinds of fruit and actually liked it. I like to do what the bigger boys do, don’t want them to think I am a baby. May 21, 2011 – I feel like a star! I didn’t have my morning nap but still loved being in front of the camera. 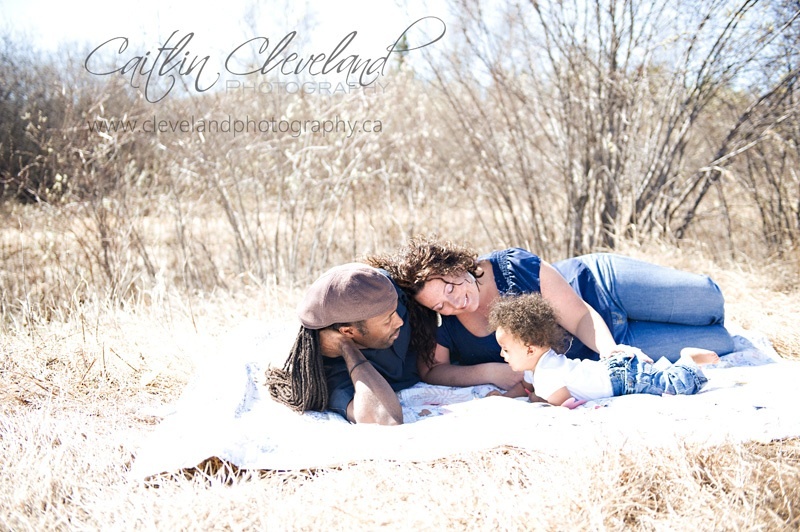 Today was our family photoshoot with Caitlin Cleveland. It is sure tiring to be a model. I slept for three hours after the shoot. Some sneak peeks are below. 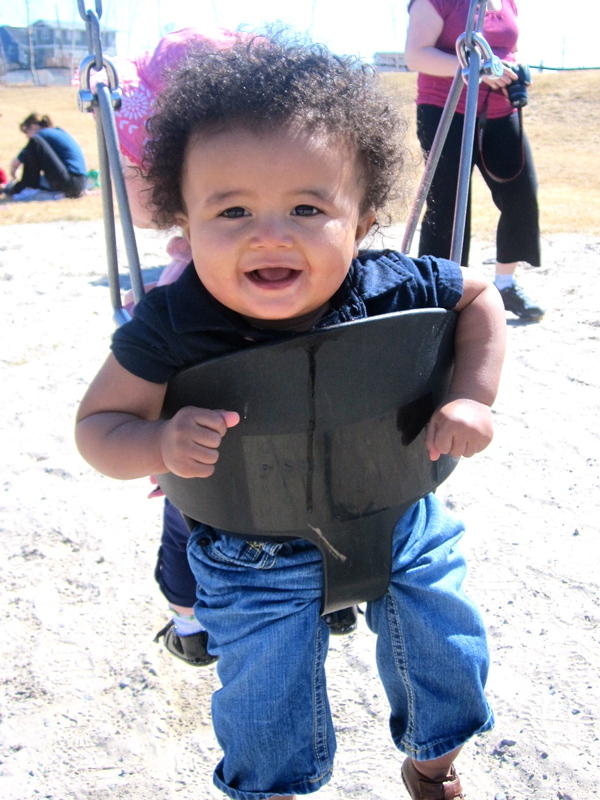 May 20, 2011 – Today I went to the park for the first time. I went on the swing with my baby friends and discovered grass. Mommy says it is suppose to be green – in Yellowknife at this time of year it looks more like straw. I didn’t fall asleep during our playdate for the time. It has started to become expected of me. So happy to see all my friends. May 18, 2011 – My Mommy received a Premier’s Award today to recognize her work on the NWT Water Strategy. She wasn’t going to go to the ceremony because I am a bit of a handful lately. Her co-workers decided that they could deal with my “sweet terror” personality, after all most of them are parents, so Mommy left my at her office for a couple hours. I’m not really that bad except I must see my Mommy or Daddy at all times! Mommy thinks those girls are a bunch of angels. I think they probably will never want to see my fuzzy little head again. Mission accomplished. Mommy wasn’t pleased. May 8, 2011 – Today was Mother’s Day. I showed her and Grandma my love by being overly happy. Daddy cooked brunch and dinner. Such a lovely day. 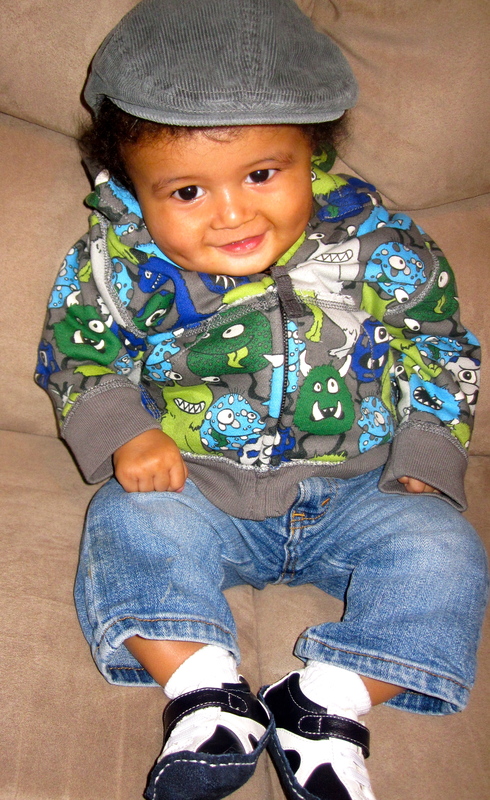 May 6, 2011 – We went to the Family Centre with Jahmiah and his Mommy. I am just starting to crawl so there was lots for me to discover. I think we need to go there more. May 3, 2011 – Mommy and Daddy bought a house! We are all pretty excited but especially me as I am now really moving around now. Not up on my knees yet, but this house is already too small for a big boy like me and all my gear. Check out our ‘House Project’ page. SORRY Friends and Family – My Mommy and I have just been too busy to update my journal everyday. Together we decided that playing is more important these days. Just know that we are all happy and healthy. Don’t worry, we won’t miss any big milestones. 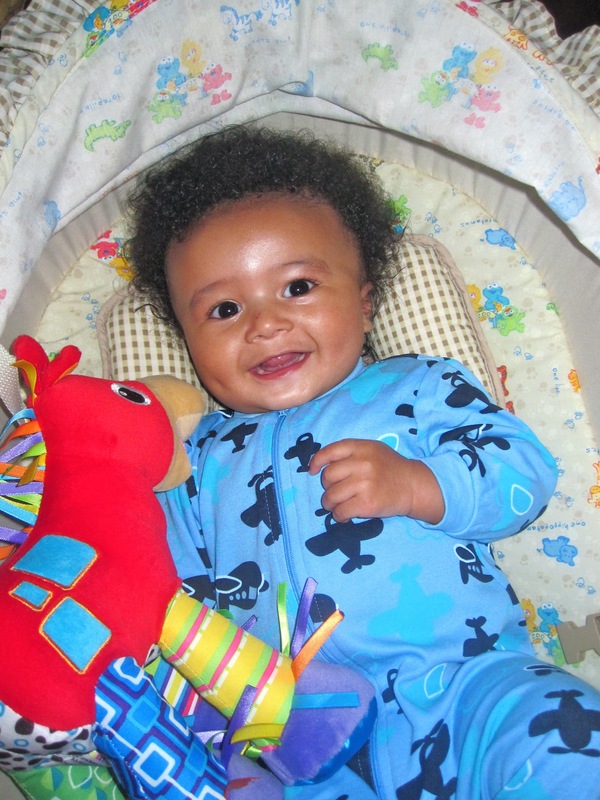 March 26, 2011 – I finally had a good night sleep and woke up smiling! Mommy and I had a long play on the floor this morning before we ate, bathed and got ready to visit my special Auntie Theresa. A little birdie must have told Great Grandma I needed some shoes because Grandma brought over some ultra stylin’ runners. I’m obviously not running yet but they will give me extra bounce in my jumper. I love them! I can’t stop looking at me feet. GG saved me from the baby fashion police. Phewf! Grandma also brought me an “Elmo loves me” sleeper from a store called Barrenland. When we went back to the store to check sizes, Mommy secretly laughed when Grandma asked if she could brag about me winning the Johnson’s Baby Canada photo contest to the ladies who were making a fuss over me. True grandmother pride. From there we went out for a late lunch before I went for snuggles at my Auntie’s house. I tried eating apples at Grandma’s tonight but I am really not a fruit guy. I make a face like Mommy is forcing me to eat the sourest of candy. Yuck. I fell asleep in Daddy’s arms on the couch tonight. He was busy helping Harvey all day so I didn’t see much of him. March 25, 2011 – Sit, sit, sit – that is all that is on my mind. Mommy and I hung out in the house for most of the day. Tania came over in the afternoon for a few minutes before Mommy went out for coffee without me. Can you believe it? I needed to have a nap because I skipped sleep until 3:30 pm today. Mommy’s friends were disappointed I didn’t tag along. After coffee, Mommy had nachos at Grandma’s so I could have some quality alone time with Daddy. I can’t tell you what we did because there is always a cone of silence when it comes to our time together. Just before bed, we got a surprise video call on Skype from Grandma, Auntie Peggy, Uncle Keith and Great Grandma. I only talked a little bit though. I had to save some stories for next time. My uncle told me next time he might hold up one of the scorpians he has been hunting in Arizona. That would be way cooler than snakes and snails. 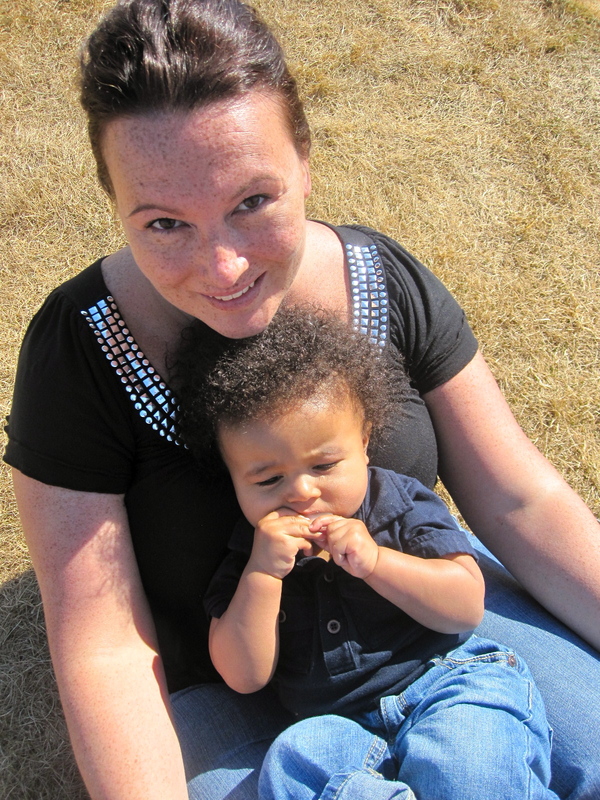 March 24, 2011 – Mommy and I spent the day at home. It was only -3 outside but it was pretty grey. I figured out how to remove the toys from my exersaucer. At 26 weeks, Mommy and Daddy can only imagine what is to come. Yikes! I have more news. This afternoon I sat. Ok, so it was only for a short period of time but I did it all by myself. Daddy missed it because he was helping my special friend Harvey. This body is getting stronger everyday. I am going to be a champ like Daddy. I got so hungry from all the exercise that I ate a whole jar of butternut squash, which I promptly smeared all over my face and in my hair. Mommy is usually very careful feeding me but today I was a little over-active. Grandma came over to see me after work. I had my cranky pants on though as I hardly napped again. As soon as she left, I snuggled with Mommy. I was extra sweet, belly laughs, funny faces and all. 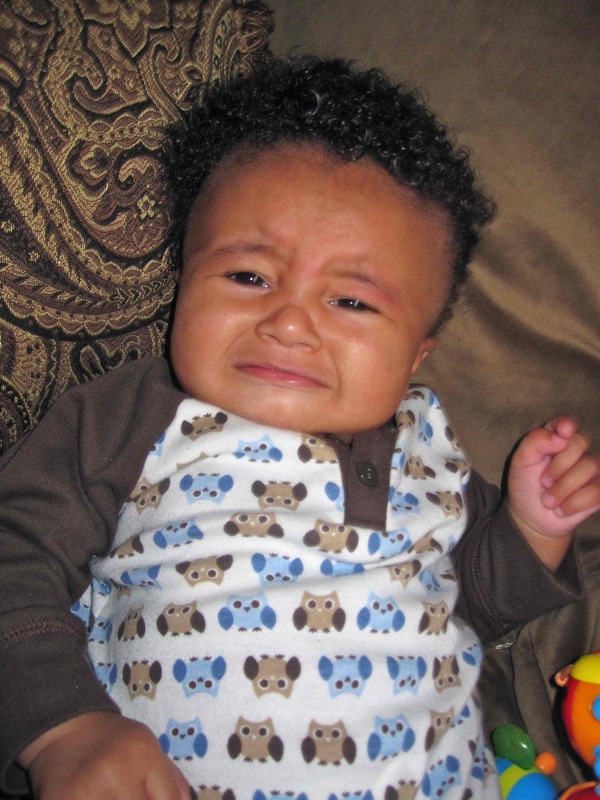 Oh, the emotional ups and downs of being a baby. Grandma started calling my new funny face my “Myrtle the Turtle” look. March 23, 2011 – We had lunch with Myranda today. It was so nice to see her that I was on my very best behavior. I even let Mommy eat her lunch with two hands. I could only be an angel for so long though. As soon as we got to Mommy’s office, I decided to be fussy. I was really just sleepy since I am still rebelling against sleep – both at night and in the day. It wasn’t because I didn’t want to see Mommy’s friends. Then we went to Grandma’s office to do a little more visiting. It probably wasn’t the best day to socialize but since we were out we made all the stops. When we got home, Daddy had the house spick and span. Mommy smiled. I hung out with Daddy watching television while Mommy went for a walk on the track. I decided to be nice and slept in my crib for longer than usual tonight. March 22, 2011 – A quiet day relaxing at home. Sleep training is hit and miss. I am a cat napper. March 21, 2011 – It was a beautiful sunny day. We stayed home because Mommy is determined to finish unpacking and to get the house in order. Grandma came over after work to help. We sure do love my Grandma. Mission complete. Now we can socialize more. I can’t wait to make some more little friends. 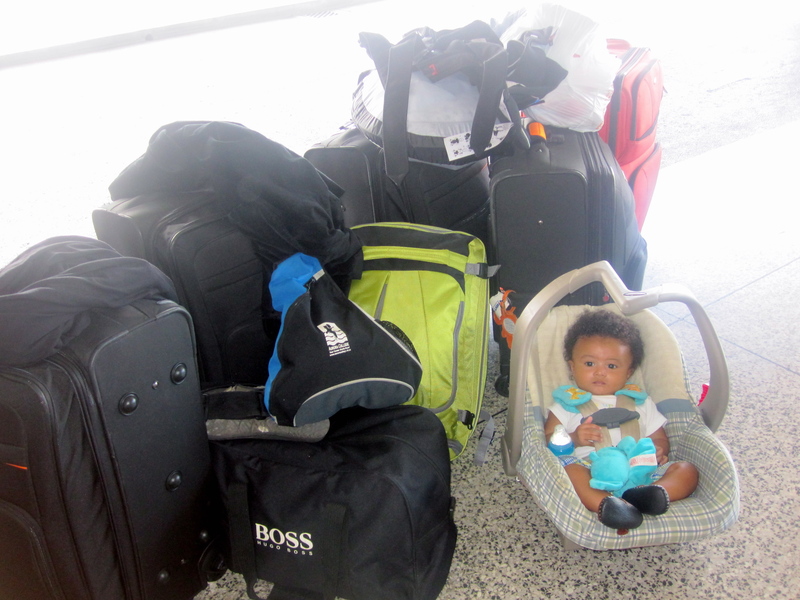 March 20, 2011 – Mommy is still trying to get our suitcases unpacked. I don’t let her get much done. I just want to play. I played so much this morning that I ate a whole jar of turkey and sweet potatoes for lunch. My feet are meant to be bare. I have figured out how to kick my socks off. I get much more traction in the jolly jumper that way. We went Grandma’s at 4:00 pm for dinner. I love my new high chair. Teddy and I had a great time playing with toys while Mommy, Grandma, Dragana and Paulo chatted. Daddy came after the gym. March 19, 2011 – Today I grabbed Mommy’s cup of water and brought it to my mouth for a drink. The snodel I got from Tammy is becoming my bedtime partner. I still hate sleep though. 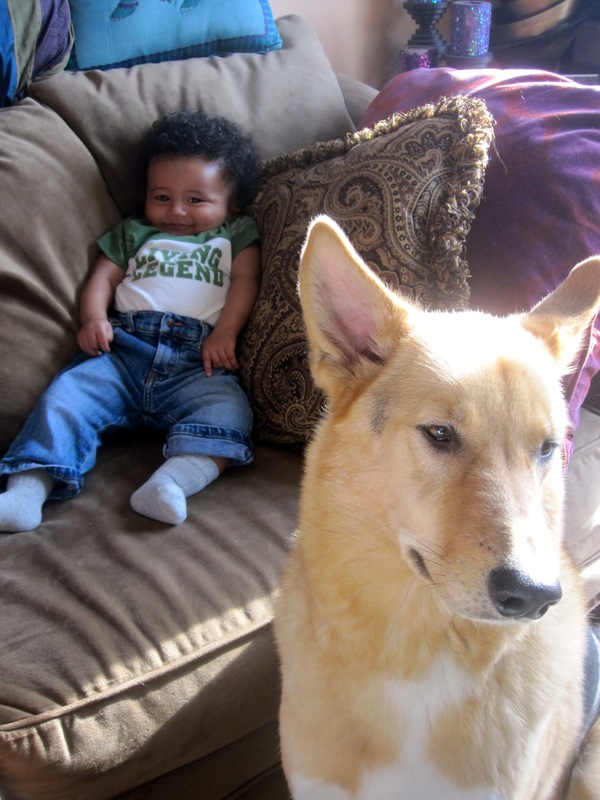 March 18, 2011 – It was total chillaxin’ at our house today. We didn’t do much of anything until mid-afternoon. Jahmiah and his mom came over for a quick visit. I lent him some of my re-useable diapers since I’m not using them at the moment. I spent some time doing a jig in my jolly jumper, pounding on my exersaucer and rolling around on the floor with some new toys until the power went out. Grandma came over with groceries to make stirfry and stayed for dinner. It was a happy day. 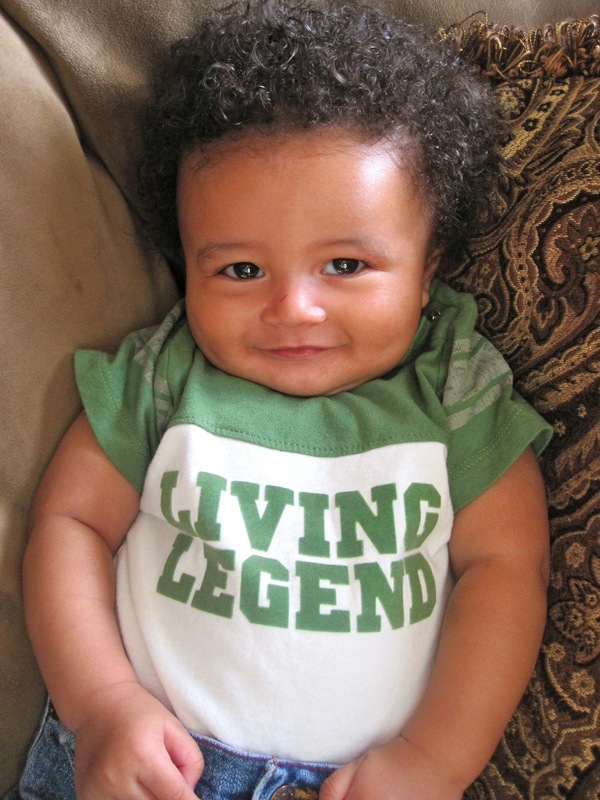 March 17, 2011 – Happy St. Patrick’s Day. Did you were green? I did. I was also full of tricks all day – just like a real-life little leprechaun. We went to the doctor for our six month check up and she gave Mommy a thumbs up for figuring out the goat milk formula solution. Then we went to hang out at Jahmiah’s house. Mommy and Tanya talked business. It made me yawn despite the fact they were talking a mile-a-minute. When we got home, Daddy had the house full of resin fumes again so we went to Grandma’s. Her computer wasn’t working so Mommy fixed it while I watched intently. If I could only get my hands on all those cords. 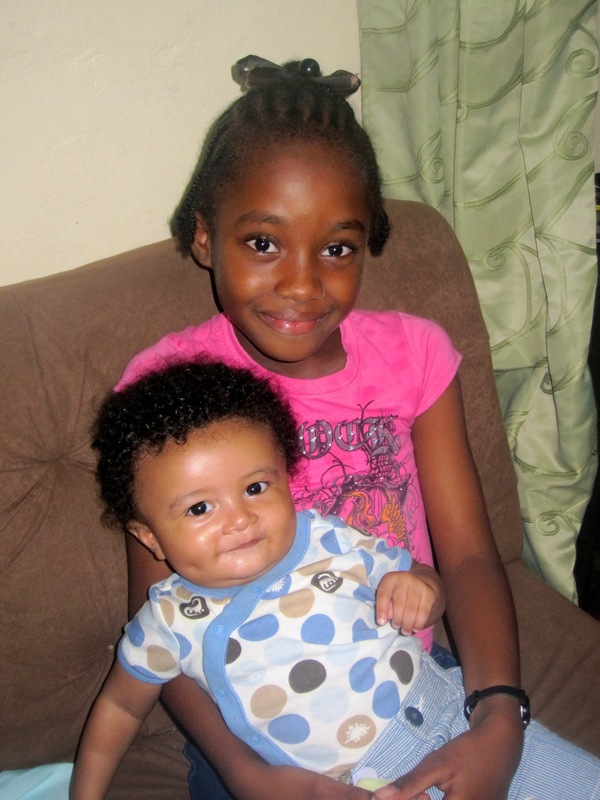 March 16, 2011 – Immunization day at Public Health. I wasn’t too happy about getting poked in the leg with two big needles but I was a trooper. The nurse gave me a big check mark for growth and development. 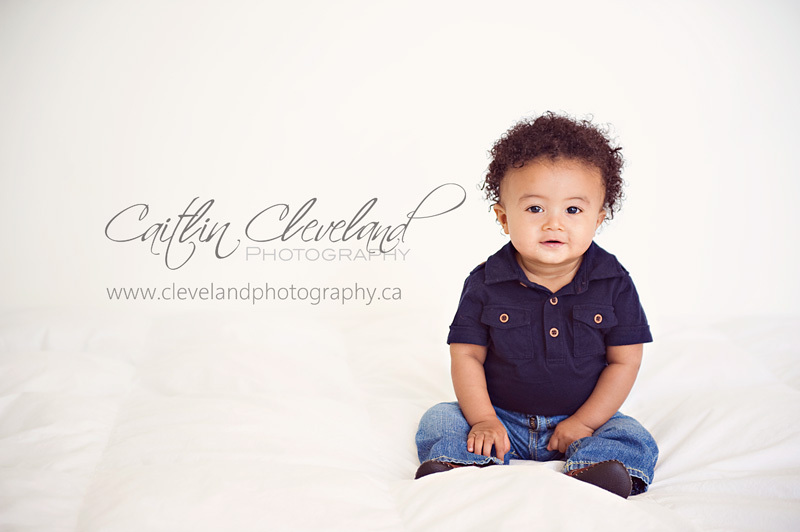 Height, 97 percentile. Weight, 75 percentile. Head circumference, 97 percentile. Ok, so I have a big head. Don’t laugh – must be all smart stuff in there. Right? Now Mommy understands why my hats don’t fit properly. 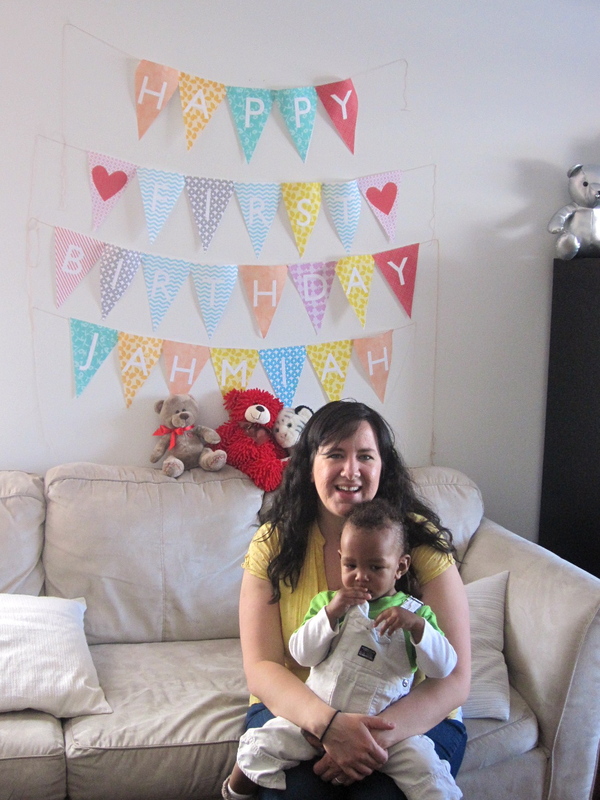 March 15, 2011 – Today is Mommy’s birthday. Auntie Peggy called in the morning. Them she went out for an Indian lunch at the Explorer with Grandma. I had to stay home with Daddy. Mommy got hit by a lady that ran a red light on her way downtown so maybe it was better that way. The damage was minor. They came back to the house afterwards so I could give her my present – a bracelet with special engraving. Grandma hung the gift bag on my arm and I held her card all by myself like a big boy. Only thing is, I couldn’t sign my name so I slobbered on it a little instead. Daddy remembered her special day. He found the perfect card. We spent the evening as a family at home watching television eating frozen pizza. Mommy thought it was perfect. Family and friends spoiled her this year. March 14, 2011 – We slept in today. I guess my crazy wide-eyed nights are finally catching up with me because I napped off and on all day long. Mommy decided to go to post-natal class at the last minute. It was like a tornado whipped through the house as we got ready for Jahmiah’s mom to pick us up. Record time, I think. It took less than half an hour from pajamas to parkas, including bottle and diaper bag preparation. Daddy was running errands and had the car. The class was about baby massage so I thoroughly enjoyed it. Afterward, we had a playdate with a couple of my little friends. Jazz has started giving me kisses whenever he gets a chance. A big doggie lick right on the nose. March 13, 2011 – Mommy had a brunch date this morning with Grandma. Turns out that it was a surprise early birthday party. She came home smiling from ear to ear with an armful of beautiful flowers and gifts. I sure do like flowers but Mommy wouldn’t let me touch them. Shucks. Some of my honorary aunties got together for a little tea party in the afternoon at Lena’s. I got to tag along. We enjoyed every minute. It would have been a perfect day except Grandma’s van died in front of our house. We had to get it towed. I hope it gets fixed soon because I like her visits. Grandma doesn’t have water right now due to frozen pipes. Mommy did her laundry in the evening and took it over. I bet Grandma will be grouchy tomorrow because Mommy didn’t get home until almost midnight. 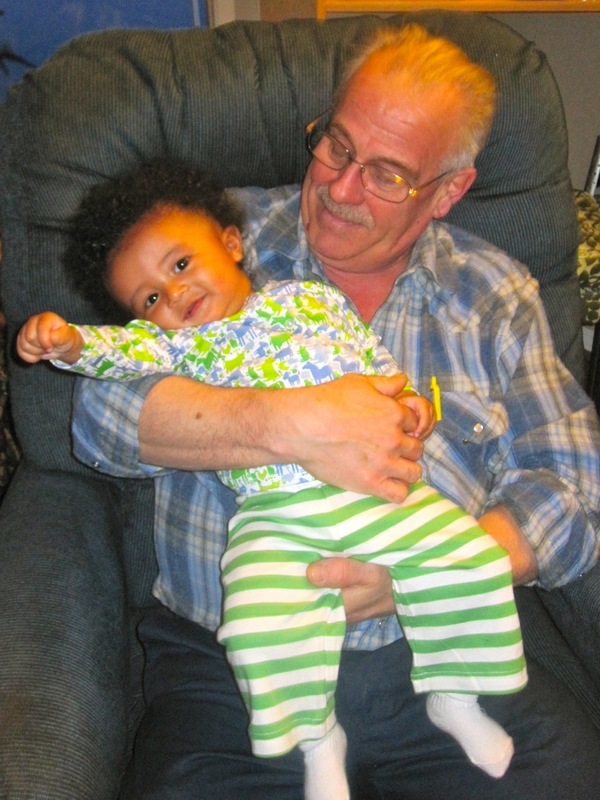 March 12, 2011 – Today I spent all morning curled up in Daddy’s arms in the recliner. I needed a snooze since I hardly slept during the night. Grandma came for a visit in the afternoon. She brought Mommy a plant with pretty white flowers and some treats for my Jazzerdoodle. Mommy tried to finish unpacking upstairs while Daddy went shopping for a birthday gift. I got to hang out in my crib. It has a elephant mobile that plays a lullaby. Mommy said Grandma made it for me when I was in her belly. 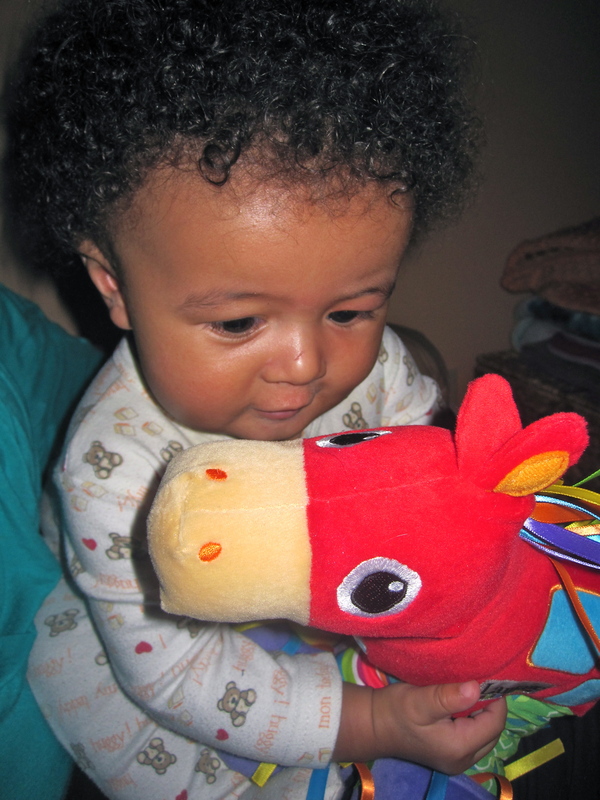 Mommy unpacked the red horse that I got from my Auntie Peggy’s family. It makes noises that remind me of the race track in Barbados. It is my new favorite toy. I decided that I like playing downstairs better than upstairs – my room is still piled high with suitcases. Grandma said that 10 years from now we won’t remember what the house looked like but we might remember playing together on the living room floor. She is probably right. 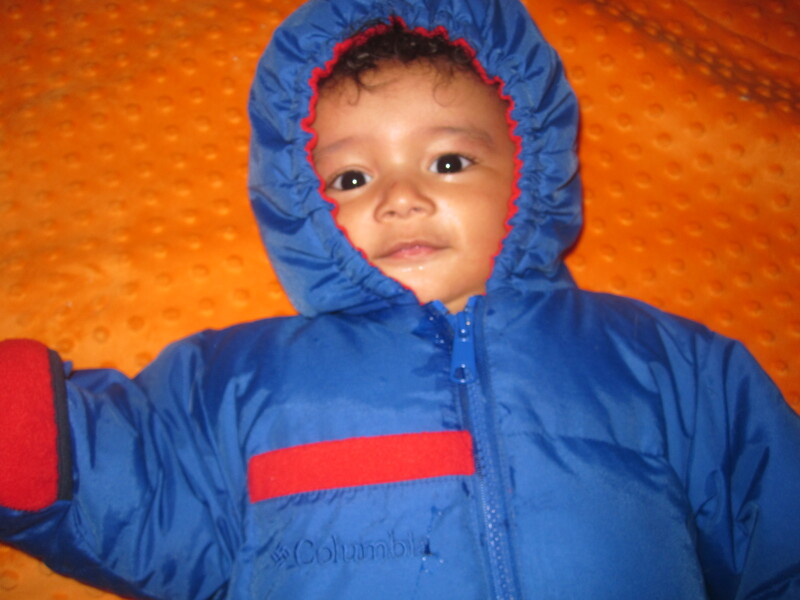 March 11, 2011 – We watched the news first thing this morning over some coffee and goat milk formula. Waves of destruction hit Japan. Horrific images monopolize the news. Mommy is worried about the friends she made in a past life working for a Japanese tour operator. In the aftermath of the earthquake and tsunami, we must be grateful for so many things. Heartfelt prayers for strength and courage go to all those affected. Grandma came over at lunch time for a quick visit. She makes me smile, but today I was even happier when she reported her doctor’s appointment was positive. I told big stories all afternoon. Mommy got to instant message with Auntie Alison. We sure do miss her family. Daddy made “hamburgers that a man could eat” for supper. I can’t wait to get my fingers wrapped around one of those yummy things. Organic brown rice cereal just isn’t cutting it tonight. Daddy continued to work on the project he started in Barbados. He is very determined but didn’t realize that resin fumes would encompass the whole house. Silly boy! Mommy and I had to go to Grandma’s for a few hours. I don’t think she minded the company, even if we stayed until 3:30 am. 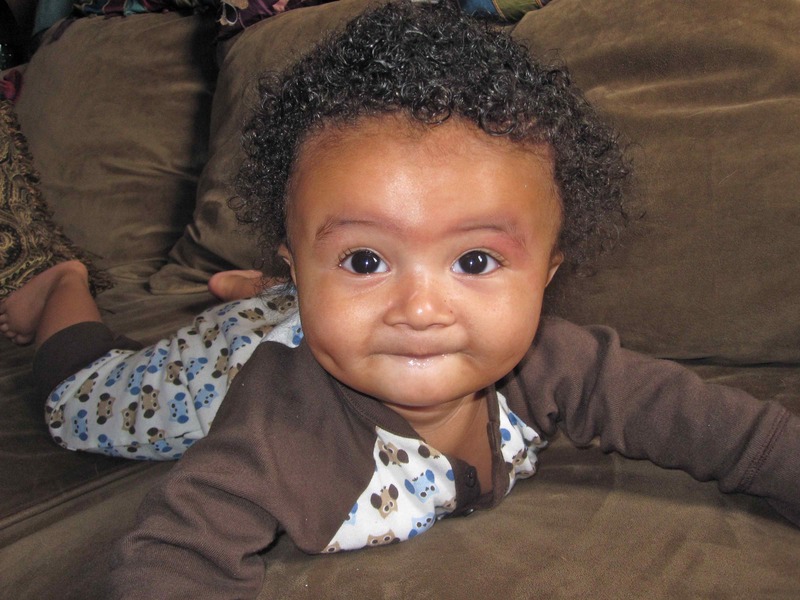 March 10, 2011 – I am baby, hear me squeal! I discovered a new sound. Grandma likes to call it singing but after a while it has been proven to give Mommy a headache. I’m working on my exersaucer skills. Daddy decided I am much to hyper and maybe some hearty food would settle me down. I am now a professional spitter. Potatoes and carrots are truly icky. On the other hand, I did munch down a big bowl of cereal. Daddy broke down and bought a new battery for car. We have wheels again. March 9, 2011 – It was a quiet day at home. Tanya and Jahmiah came over for a quick visit in the afternoon. More vehicle troubles. Jazz and I are learning to play together. It’s a toy tug of war. I have also decided to help Mommy change me. I keep trying to take my clothes off. March 8, 2011 – There is no place like home. Mommy and Daddy have never been happier to be in Yellowknife. We went to visit my buddy Jahmiah and his mommy Tanya. We have truly missed our friends. Mommy and I fell really hard on the ice. Except for Mommy’s bruised knees, we are ok. Oh, the hazards of living in the North. Mandatory crash helmets for babies? Seems almost necessary. Afterward, we picked Grandma up at the airport. I have been spending so much time at airports, maybe I will be a pilot when I grow up…??? We went shopping for baby and goat milk formula supplies. I love wandering around the aisles of Walmart. I got an exersaucer from Grandma! Mommy spent way too long trying to put it together. Aren’t kids toys suppose to be easily assembled? I really like it, even if I’m like the one-legged bandit. I only put one leg on the ground, but I am a quick study and will surely get it figured out soon. Jahmiah is going to lend me his Jolly Jumper, so I am excited about that that too. I am still a little under the weather. March 7, 2011 – How many times can I say freezing? Well, zero actually since I can’t talk but I can shiver. This weather is for the polar bears only, not this little monkey. Today we stayed in the house to keep warm. It is colder than -40 degrees celsius. The vehicles didn’t start so Daddy spent most of the day trying to get us mobile. Mommy and I hung out reading some of the books we got for Christmas. Things are back to normal, we spent the evening plunked in front of the television in the comfort of our own home. Grandma went to Fort Smith this morning so she didn’t come for her regular evening visit. March 6, 2011 – Woke up at 4:00 am to get to the airport. Two hours after the flight left for Yellowknife, we were still standing at the counter. I was especially well-behaved, even if I was breaking Mommy’s back in the Baby Bjorn carrier. First Air screwed up the tickets leaving us stranded again. Daddy is now seriously considering a new career. We spent the rest of the day at Grandpa’s relaxing. It was actually nice – almost like a stolen day. I think the airline folks felt sorry for us because before we even got the check-in counter tonight they came running with boarding passes. Thank goodness this is the final leg of our journey. I have managed to catch a bug. Sniff. Grandma picked us up at the airport. We came home to a clean house and a very happy dog. Hallelujah. March 5, 2011 – Arrived at Edmonton airport in the morning. “Yahoo! One more flight closer to home.” Let me shout it out like the Bajan cowboy Mommy’s friend Shawn told her not to let me become. I don’t think I can escape my Alberta roots. I was so excited to see Grandpa, but not so thrilled to put on my snowsuit. We spent the afternoon hanging out in Wetaskiwin visiting with Grandpa and Great Grandma. Daddy made a steak dinner on the grill he got for Christmas. All our presents have been packed up for a couple months so it like unwrapping them all for the first time again. Mommy and Daddy missed the simple things the most while we were away – grocery shopping, cooking, an oven, a microwave, hot water, internet connection, television…the list goes on. It’s grand to be back on Canadian snow! March 4, 2011 – Back to the airport. Each of our six suitcases are exactly 50 pounds. Thank goodness for portable weight scales. Mommy and Daddy swear from now on we are traveling backpacker style. It doesn’t matter to me. It’ll be a few years before I have to carry them. Up, up and away! I am a super traveler. Put me on a plane and I sleep. Mommy wonders why I don’t nap like this on a regular basis. The flight was great. All the flight attendants commented on what a good baby I am. We are staying in the hotel right at the airport in Toronto so we can manage our luggage easier in the morning. March 3, 2011 – It was a super chaotic day. Mommy and Daddy got up early to finish packing. We were really hoping to get a flight back to the land of ice and snow. Crazy, I know. Even though I can’t really remember what it is like since I am a true beach baby now. We made it to the airport on time after dropping off some of my outgrown clothes for Liam. Surprise, surprise – there were no standby seats available. Mommy is starting to lose her mind and feels trapped on the island. We ended up at my Auntie Veronica’s. Mommy spent the evening trying to buy full fare flights to get back to Canada. So much for Daddy’s flight benefits. I played with my cousin Chania until we went over to Uncle Alfred’s place. I got a hug from my cousin Ashley but the rest of the house was sleeping. They will probably be happy to see us go as we have kept them up night after night. I might feel bad except I loved every minute of our time together. March 2, 2011 – It was suppose to be a beach day, the last one of the trip. 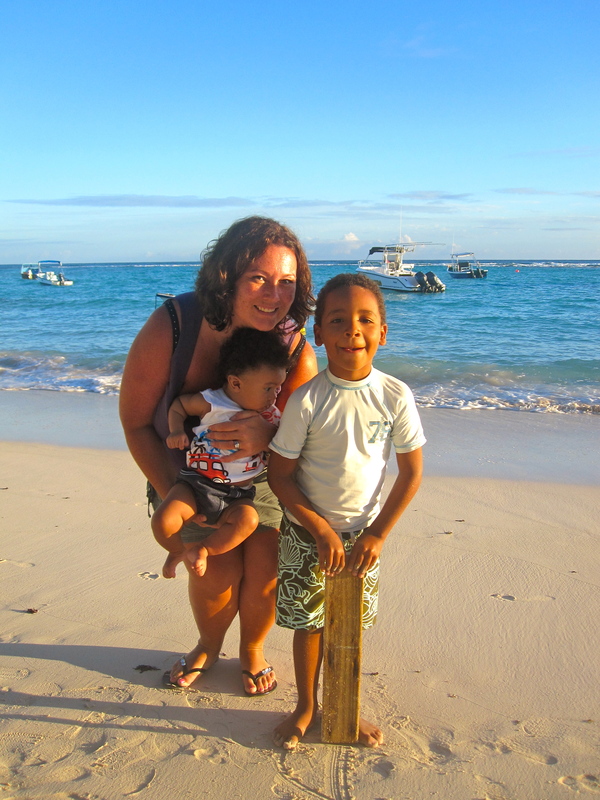 Instead, Mommy and I sat at Crystal Waters on Sandy Beach with Jackie, my buddy Liam. and a few other local friends. Darn rain. Mommy took pictures of my feet in the sand. She had hoped to do this with Daddy but we never did have a family day at the sea. Guess that means we will have to go back. We stopped at Uncle Alfred’s on the way home. 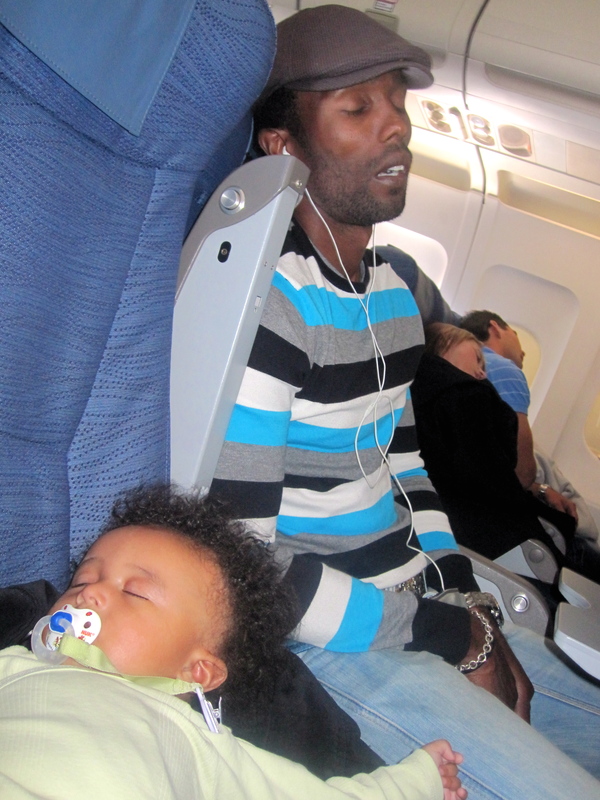 March 1, 2011 – Flights were full. February 28, 2011 -Tried to get a flight home. No luck. Planes have been full for a week or more already. February 27, 2011 – Spent the day packing up the apartment. Mommy got a few moments in the sun. She said was almost asleep on the lounge chair in the yard dreaming about burritos when a big male monkey almost jumped on her head. Mommy is so tired of Bajan food. 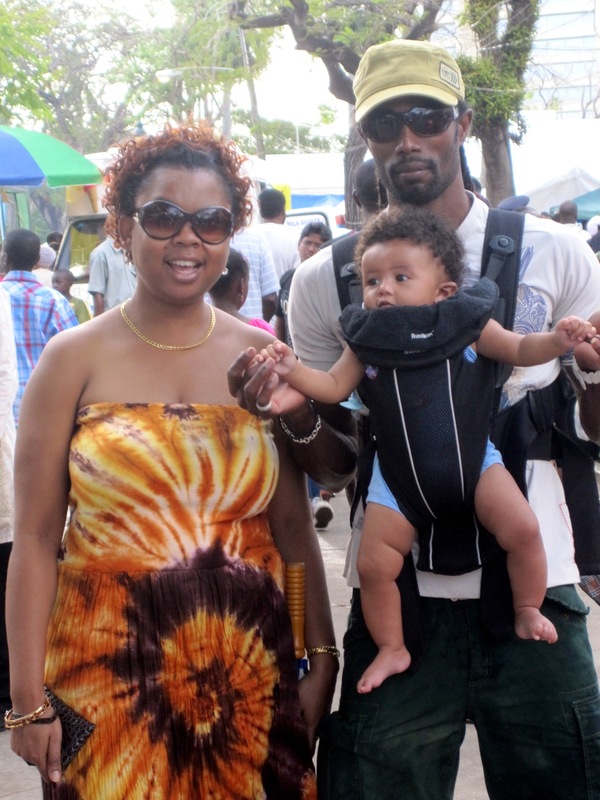 February 26, 2011 – I went to Agrofest with Auntie Alison, Mommy and Daddy today. It was pretty rainy so we ducked in and out of exhibitor tents. The highlight was probably the multi-coloured fluffy baby chicks. So adorable. Mommy thought that the country line dancing was quite comical too. 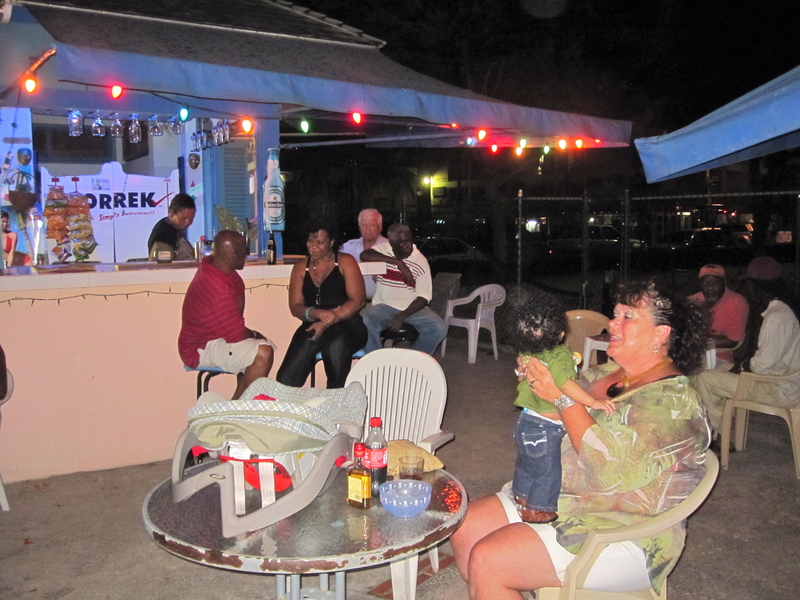 Heel, toe, do-se-do…as Caribbean music filled the air. I just sat back and took it all in while Daddy carried me around on his chest. We saw birds, pigs, goats, blackbelly sheep, horses, cows and bunnies. Mommy bought some blackbelly sheep milk and molasses soap which is apparently the secret to Bajan women’s beautiful skin. I even had an up close and personal personal visit with a spotted blue cow. We spent the evening at Auntie’s house getting in as many snuggles as possible. 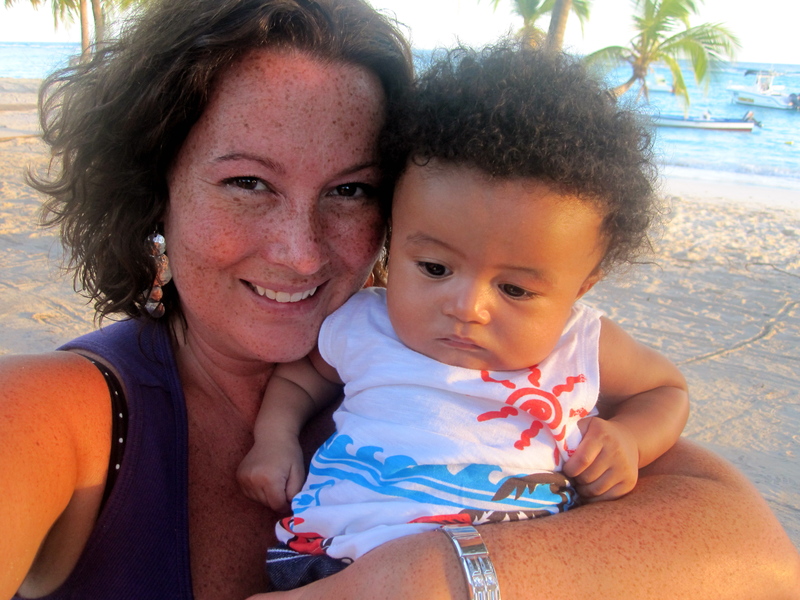 February 25, 2011 – We had a playdate at Accra Beach with Jackie and Liam. It was a lovely day. Then it was date night for Mommy and Daddy. Auntie Veronica offered to babysit. I cried non-stop. She eventually called to see what she should do with me. Daddy told her to take me for a walk around the block. She did and I finally went to sleep but by that time Mommy and Daddy were on their way to pick me up. Mommy laughed when she took the photo below as it pretty much captured their date. They spent much of their night in the parking lot of the Allamanda Beach Bar and the Tiki Bar checking in with Auntie to make sure I wasn’t being a terror. I tried to be. I don’t like it when I can’t see either Mommy or Daddy. Good thing that I am extra cute. On the way home, we nearly missed a head on collision with two cars that were racing. Daddy saved us by hitting a tree instead. We are all safe and thankful – even if we have to pay for damage to the rental car. 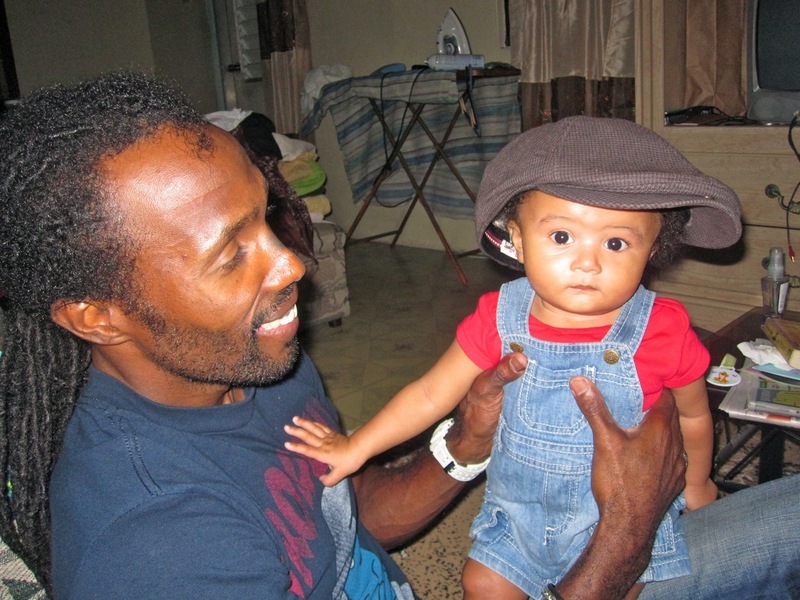 February 24, 2011 – I applied to be a Barbadian citizen like Daddy. Like anything on the island, it took all day. I was hot and exhausted by the time we got home. It is suppose to take three months to process. Anyone want to bet a teething biscuit when it will actually come in? Heck, by that time I might be more interested in scooters. I AM BACK. I graduated to size three diapers. My hair is a little wilder. Have continued to work on my rolling skills. I can grab my bottle and put it in my mouth – the glass bottles are a little too heavy for me to hold on my own though. My legs are getting much stronger – jumpity jumpity jump. 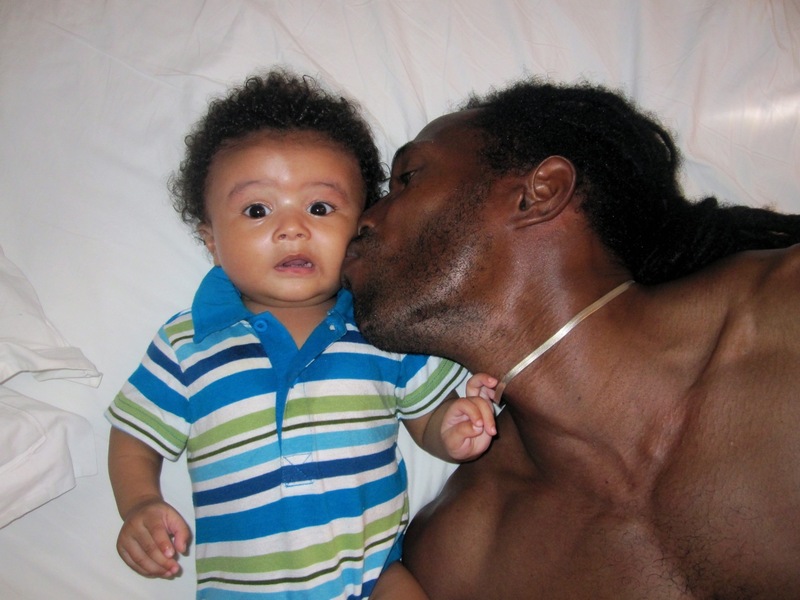 February 16, 2011 – Mommy, Daddy and I are locking ourselves away from the online world for at least a week. Catch you on the flip side with any big milestones – that is if this baby techno-junkie can stay away from the keyboard. I love anything with a screen. Big love from little me. February 15, 2011 – A quiet day at home. Daddy was busy washing clothes at Auntie Veronica’s and buying shoes for my cousin Kyson in town. He surprised Mommy with some new shoes too – green ones. Mommy and I had our very first afternoon nap together. She put me down and I went right to sleep without any fuss. I am also starting to play with toys all by myself. I like the tags as much as the toys though. Tonight we went to a Brazilian restaurant with Grandma. 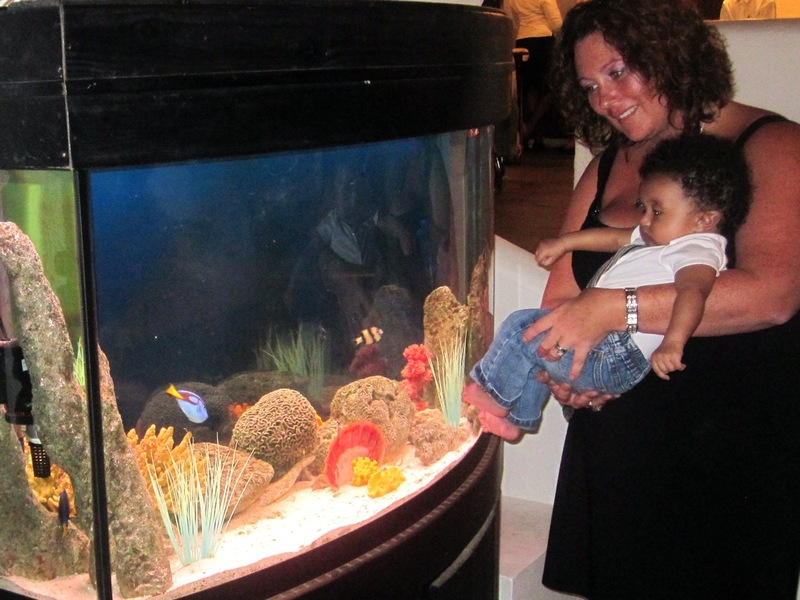 There was a big fish tank. I was fascinated by the movement and colour. My special friend Teresa sent me an email that made me smile. She said she had a dream about me – we were thinking about her today too. February 14, 2011 – Call me cupid. Today I delivered a special present to my Grandma. I gripped her Valentine card in my two little hands and Mommy hooked the gift bag over my arm. She smiled from ear to ear and put her earrings on right away. I am learning so quickly. 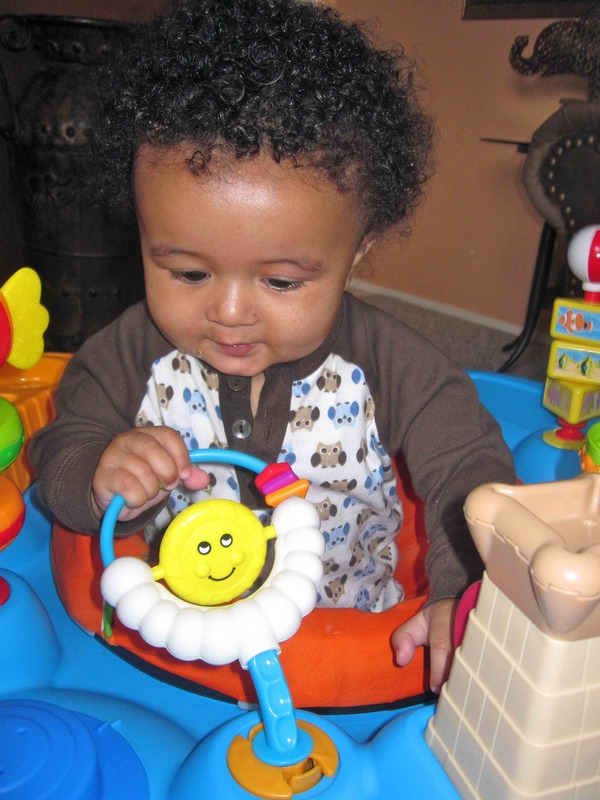 Everything is a new toy – Mommy’s earrings, Grandma’s smoothie, Daddy’s cell phone. I especially like the rattle that Dragana brought me from Europe. I have also perfected my fake cough – I know people will give me their immediate attention when I start to sputter – only thing is, I think they are onto me. Daddy thinks occasions like today are over-rated so he didn’t make any plans. Good thing I am so darn cute. At the end of the day, Mommy was happy to hang out eating pizza and admiring me on Grandma’s patio. We kept checking to see if GG was online but were unsuccessful. Tonight I went to sleep in my own bed all by myself. I weigh 17 lbs 3 oz and am 31.5” tall. Mommy used the luggage scale and my inchworm toy from the Minty family to measure me. Happy Valentine’s Day! 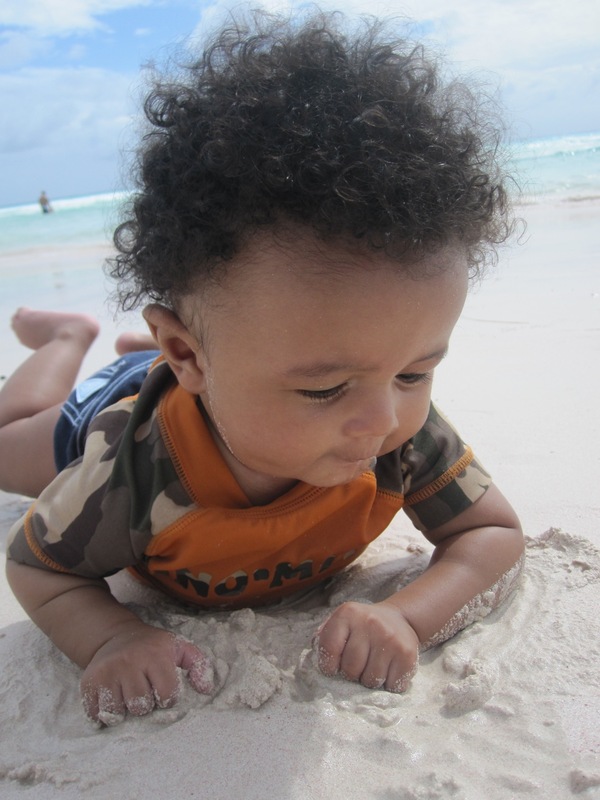 February 13, 2011 – We spent the day at Sandy Beach. Mommy finally got enough sun to take home a pink glow. She was happy. Grandma was too hot. I got my toes in my mouth. Oh man, that was hard work. Mommy and Daddy went to a Tiki Bar on the beach in Hastings to listen to a local singer tonight. Yes, I went too. Daddy danced with me under the starlight. It was a beautiful clear night with waves crashing against the shore. I loved it. 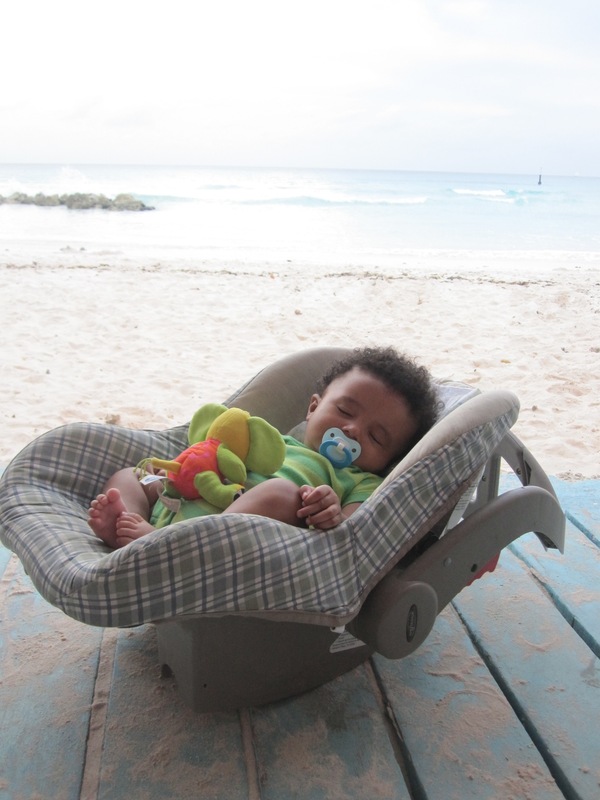 All the fresh air made me sleep like a baby – oh wait, I am a baby. February 12, 2011 – Daddy went to the dump this morning to find more parts for his latest project. He came home to tell us about a man who hid in an old fridge to escape the rain. 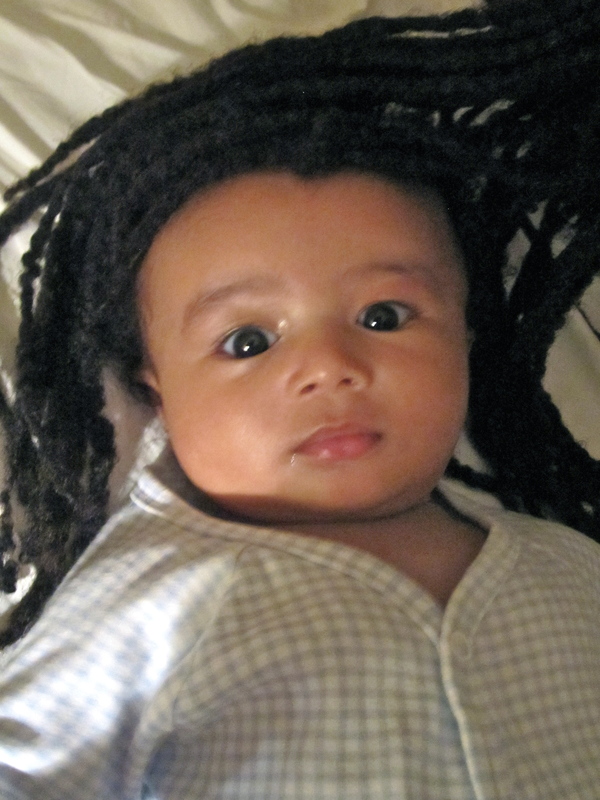 “Rastaman, don’t laugh at me!”, he shouted at Daddy. Bajans are scared of the rain. Mommy always jokes that they are made of sugar and might melt. Daddy found a sheet of metal to hold over his head. 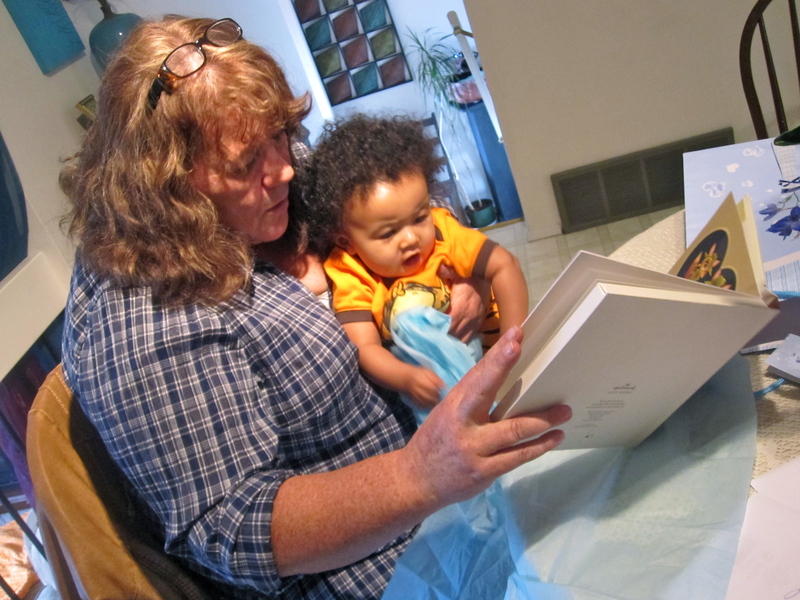 His stories reminded Mommy of Walt Humphries’ column in the Yellowknife newspaper. We are starting to miss home. We got ready and went to town about noon. I love people watching. I should have been sleeping but I didn’t miss a minute. Mommy was worried one of the shopkeepers might steal me – it continues to be non-stop attention everywhere we go. The horse races were the next stop. Grandma came too. We left none the richer but much wiser thanks to two local three year olds. They knew all about the horse track (e.g. always bet on horse number nine) and were full of talk. They were curious about me and asked Mommy where babies come from with a giggle under their breath. Mommy explained that I live in the far north, near Santa. They were quite disgusted with that answer – they really wanted a lessons about the birds and bees. While Mommy was busy watching the races with her new little friends, I got my bottle in my mouth all by myself. We had supper at a place called Blakey’s. It was a comedy of errors, so much so that we couldn’t help but laugh. I am getting busier and busier all the time. Tonight I reached Mommy’s plate and got a handful of pepper sauce. I was hot stuff – literally. 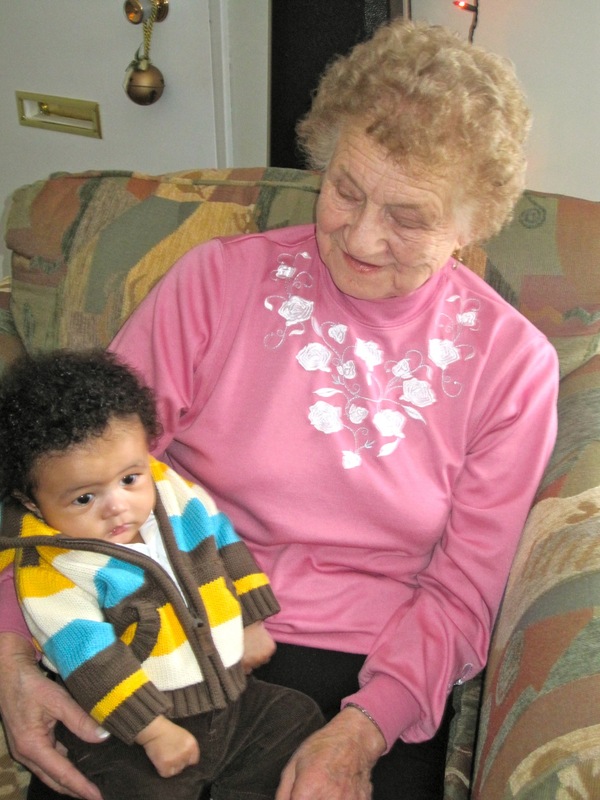 February 11, 2011 – Grandma came over and we went for a long drive. We stopped at a bakery in St. Lucy, the Animal Flower Cave, River Bay, Chalky Mountain potters and a few other photo spots along the way. Most of the places were new to Mommy and Daddy. I am a pretty good traveler. I sleep. Unless there are people, music or animals, I’m not very interested. Mommy did five miles on the Garrison track before it got too dark. We went to Oistens for supper and home to bed. February 10, 2011 – Downtime at home. Mommy went to the Garrison with Auntie Alison in the evening.It poured rain so she was one of the crazy few on the track. I almost got my toes in my mouth and have remembered how to blow raspberries.Grandma says Mommy and Daddy will regret teaching me this trick when it comes time to eat solid food. I am 18 weeks old today. 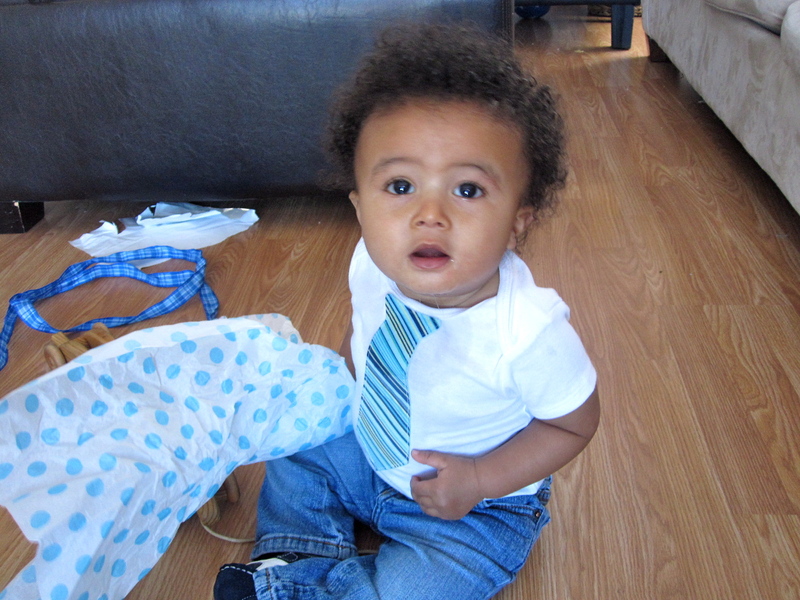 February 9, 2011 – Went to Grandma’s while Daddy went to town again. Mommy was in such a rush to leave that she forgot to give me my reflux medicine. I had a tummy ache all day. She felt terrible. Turns out we might have to go home to Yellowknife sooner than planned. Mommy learned that the northern allowance that the government claws back for being outside the NWT is a lot of money – more than she thought, more than what is affordable right now. She was pretty sad today. There is so much more to do here. I think she was grumpier than me. 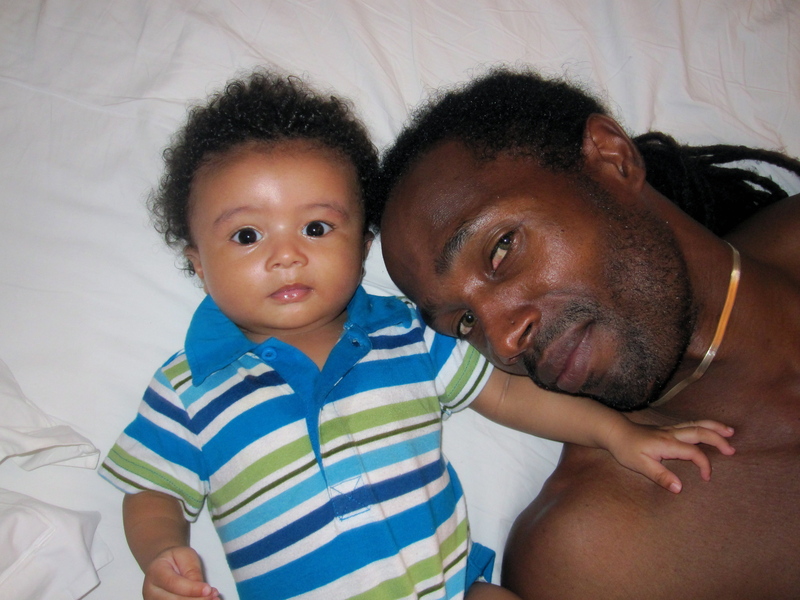 February 8, 2011 – We had a beautiful morning together as a family – Mommy and Daddy enjoyed coffee and played with me for a couple of hours. They were waiting to hear from Yellowknife friends who had arrived on a cruise ship before making plans. The friends ended up being a no-show. We dropped something off at Cousin Ashleigh’s school and went grocery shopping before having lunch at Grandma’s. My new thing this week is jumping – time for a jolly jumper. Mommy has started to call me “Springy”. There is always some crazy name coming out of her mouth. Pumpkin. Sweetieheart. Guy Smiley. Munchie. Little Turkey. Spooky. Monkey. Tex. Oh, there are just too many. Good thing I’m too little to have a complex. 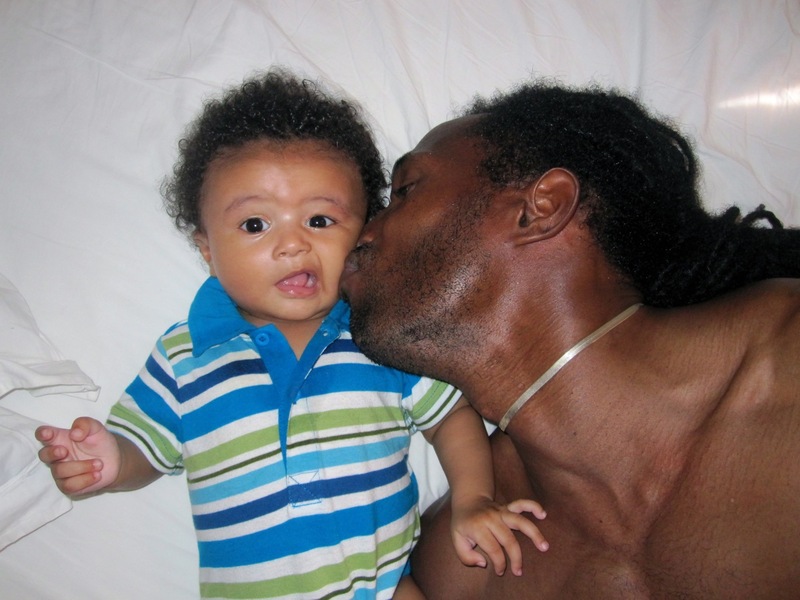 February 7, 2011 – Mommy and I spent quiet quality time together at home while Daddy went to town. We did an amateur photoshoot. 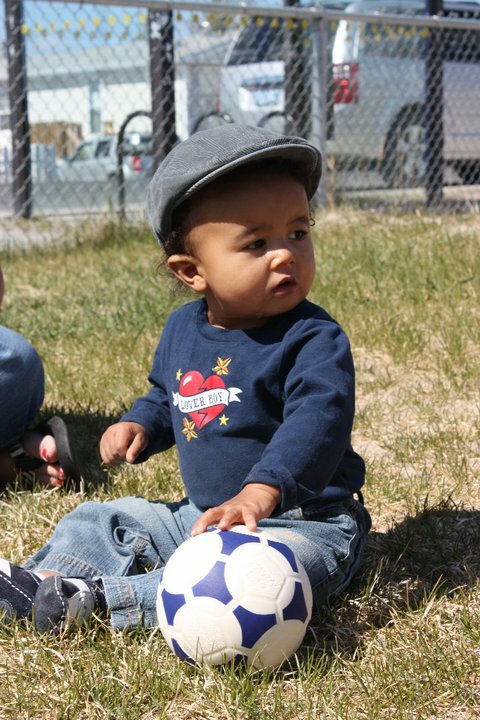 Mommy learned a few photography tips from my buddy Jahmiah’s mom before we left Yellowknife. I felt like a movie star with all the flashes. Mommy walked nine miles on the Garrison tonight while I slept at my Auntie Alison’s house. 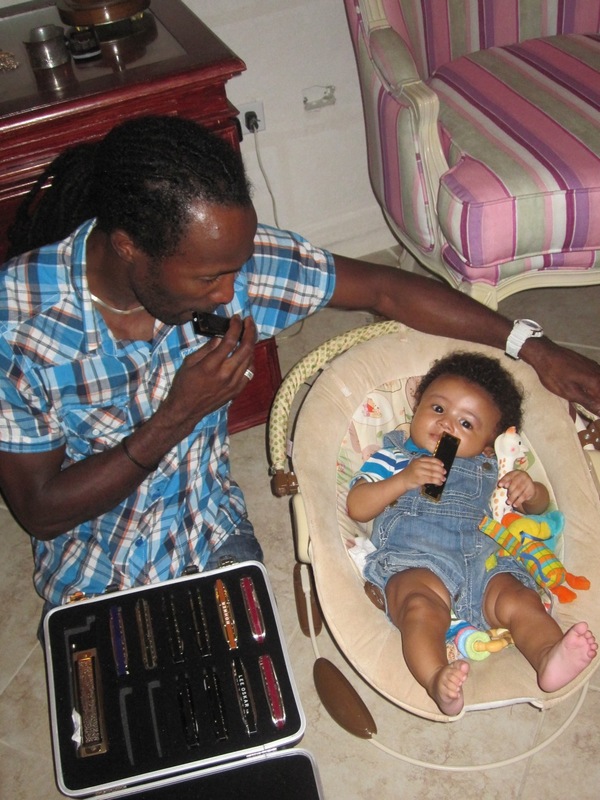 Then Daddy gave me my first harmonica lesson. February 6, 2011 – I am a party animal. Once the music takes ahold of me, I forget that I can be such a high maintenance baby. I dance and sing until I get tired. Then I do it all over again. I want to be on my feet all the time. “Muh feet on fyah” are the lyrics to a soca song. 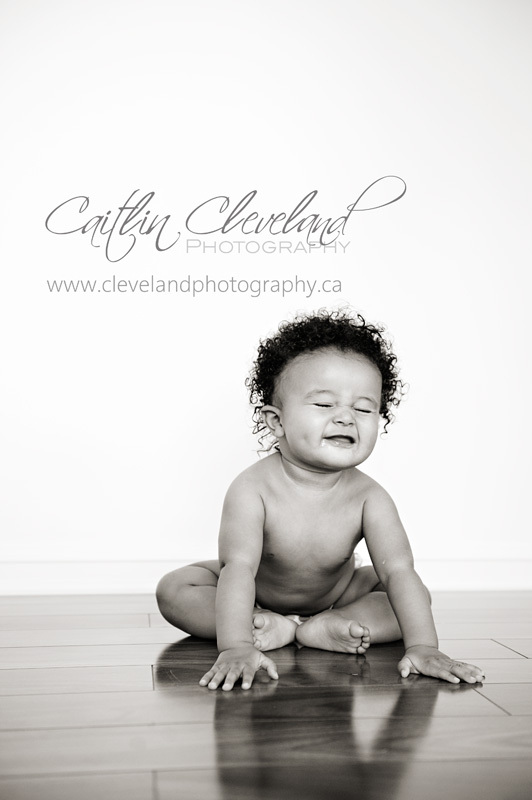 Mommy laughs every time it plays – it is my tune. We spent the day at Sandy Beach, our usual Sunday lime. It rained a few times which isn’t that unusual, but today Mommy didn’t even fret about the clouds. She said the raindrops were tears from above – tears for one of my ‘beach uncles’ who decided to leave this world. Even with a somber mood, we had fun. People made a point to tell Mommy how sweet I am. Of course, she likes that. It never gets old. A tourist lady named Hazel invited us to share her table so I didn’t get wet. We spent the afternoon getting to know her. She is a Trinidadian living in England. Some people thought she was my grandma and that Grandma was Mommy’s sister. Grandma liked that even though I don’t think you could give her a million dollars to hand over her actual title. Grandma and I are buddies again. She is the best dancing partner. Mommy made plans with Liam’s mom for a playdate and they had a heart-to-heart chat. 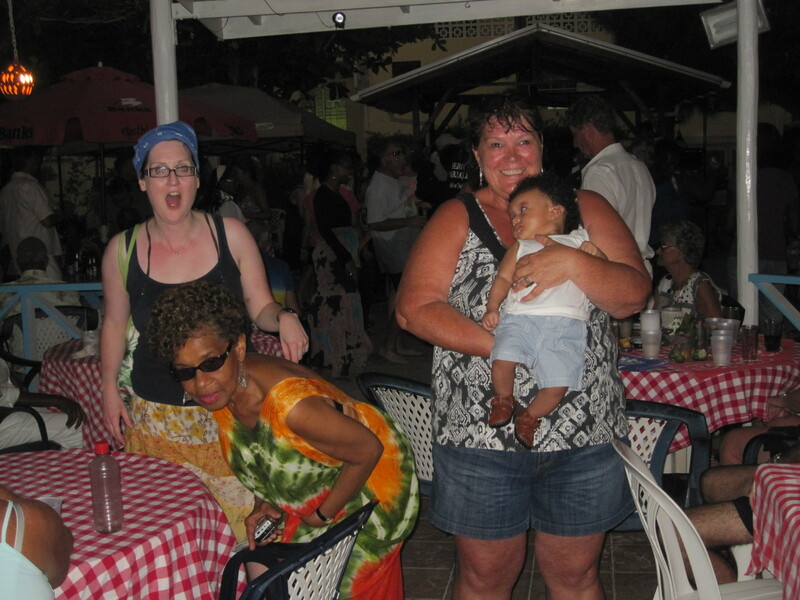 She also met a few new tourist friends on the dance floor. Mommy said it felt like old time Barbados where friendships are fast and the energy is carefree. There is something to said about ‘shared experience’. We ended the night at karoke in Dover. Daddy picked us up at midnight. He spent the day at his brother’s place. 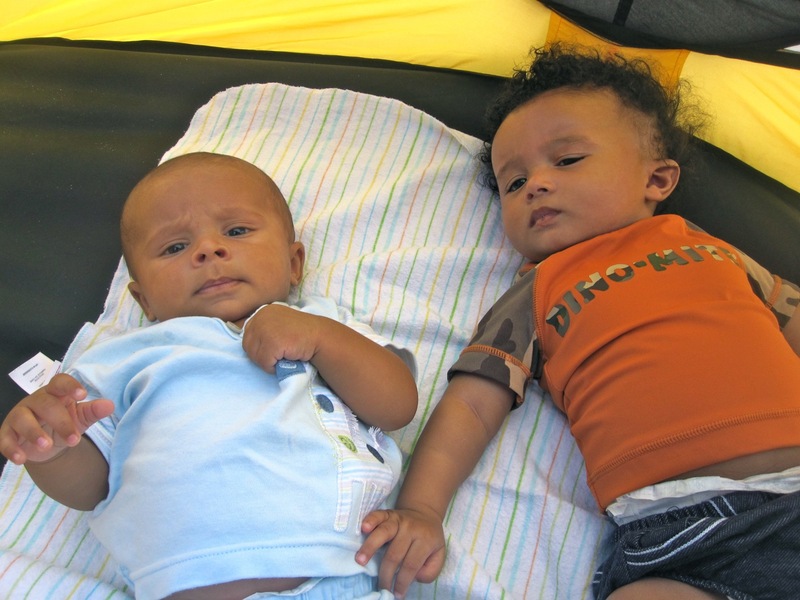 February 5, 2011 – While the Mommy is away, the boys will play. Mommy went to the beach and then out for dinner with Grandma today. Daddy says I was an angel. That is his story and he is sticking to it. Mommy thinks my Auntie Veronica might have helped out a little – just a hunch. I’m not saying a word but give me a few more months and I might. UPDATE: Can you hear Mommy’s belly laugh? Daddy just let on that I my halo is a little tarnished today. I think he is starting to understand why Mommy needs a break every so often. I can be a handful – sweet little rebel that I am. Febraury 4, 2011 – Went to Grandma’s again. I was a little brat. Everytime Grandma would so much as look at me, I would cry. The minute she would look away, I would laugh. I wasn’t really scared or unhappy – “just playing the fool” as they say on the island. Mommy decided to walk around the cricket field since she couldn’t leave me to go to the Garrison as planned. Turns out it was game night. The boys were warming up. Mommy sure had a lot of admirers, both on and off the field. At one point, she was even directing traffic. 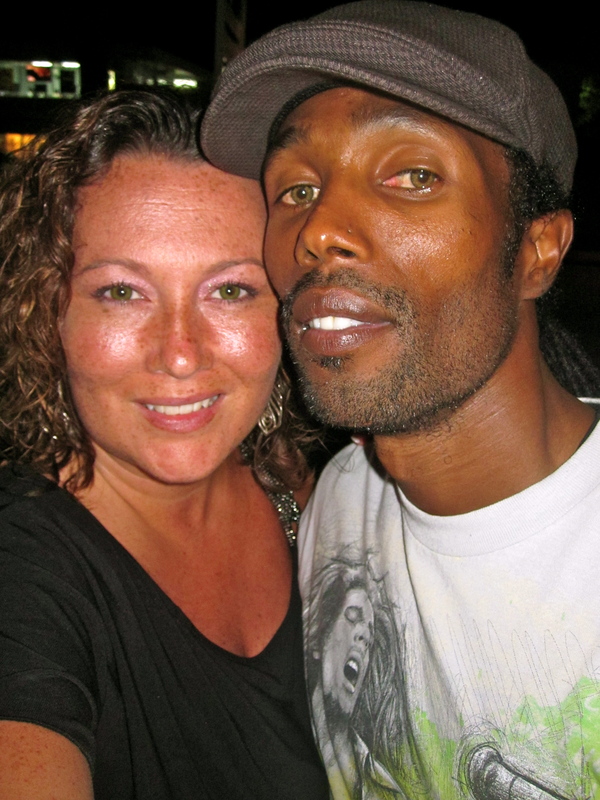 It was one of those ‘only in Barbados moments’. I didn’t want to miss out on the excitement so I gave Grandma an extra hard time. In the end, Mommy scooped me up in her arms and carried me for a few laps. I sure did like the lights and bright uniforms. Mommy says there is a storybook and a song about a donkey that plays cricket – she promised to buy it for me. Chinese food and then home to bed. 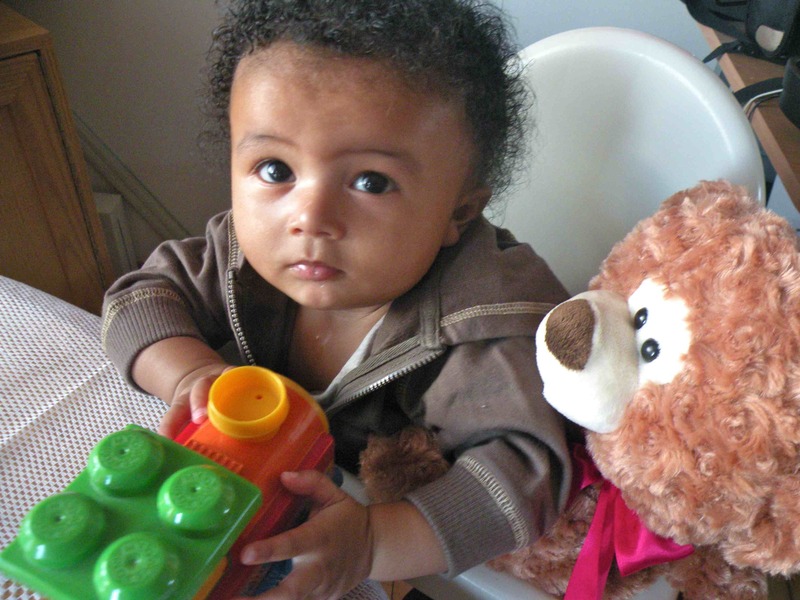 February 3, 2011 – Spent the day at Grandma’s with Mommy. It was a laid back day until the government decided to fog for bugs without any notice. At one point, Grandma said it looked like something was on fire down the road. Then all of a sudden it was like a scene out of a war movie. This army-looking vehicle loaded with men in gas masks who were armed with hoses appeared out of nowhere. It was only seconds before the patio was engulfed in black smoke – we could hardly see each other. Mommy and Grandma ran to shut windows and get me out of the fumes. I haven’t seen either one of them move that fast in my entire life. I kind of enjoyed the action. I was all smiles after the scene settled. The three of us went out for supper. I helped Mommy read the menu just like I knew what it said and was incredibly well-behaved. Then Mommy and Daddy tried to have a date night but I would not let them out of my sight. I have decided to make strange – even with Grandma. I am becoming a very “strange” character. 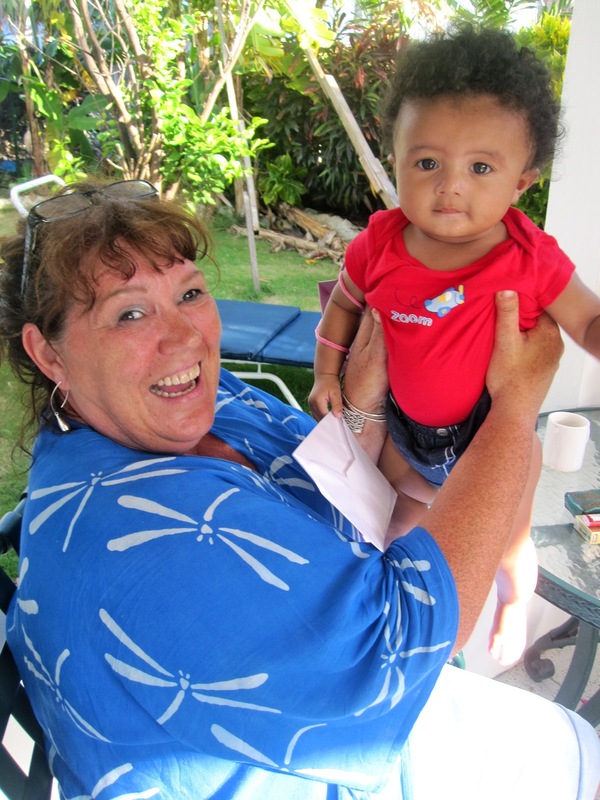 February 2, 2011 – Today I met my Great Auntie Doreen and her sidekick Lillian – two very special ladies. We spent a lovely afternoon having lunch and visiting about everything under the sun. They adored me and couldn’t get over the fact that I am in love with the television. I get especially excited when politics is showing. Mommy thinks that is bizarre. I also got to hear stories about Daddy and his family. 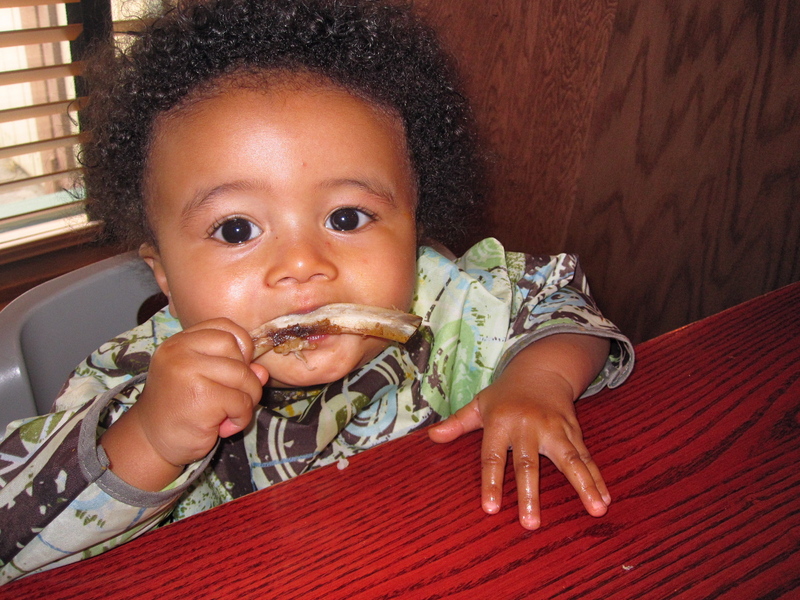 Daddy was a very fussy eater as a baby and refused to eat if anyone was watching. I learned that my Daddy’s grandma, Georgina John, was from St. Lucia. 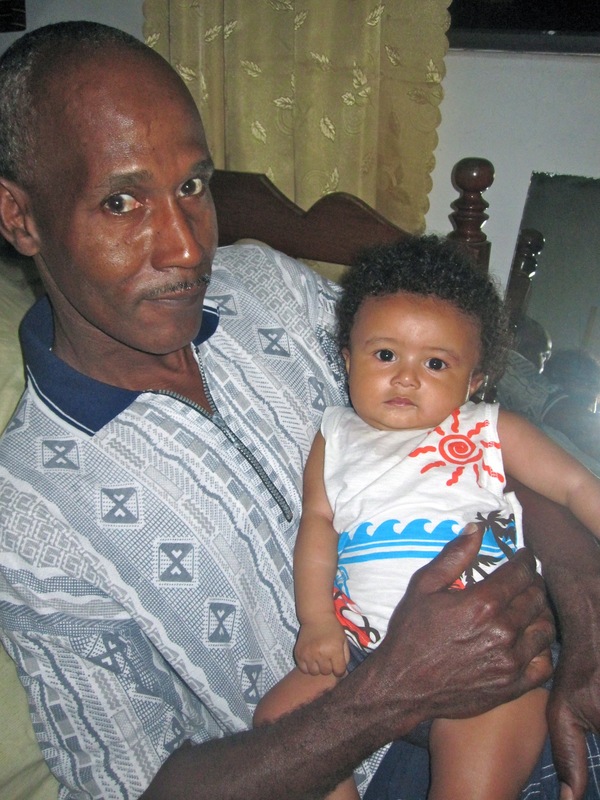 His grandpa, Nathaniel Forde, was from Trinidad and had almost the same skin colour as Mommy. Daddy’s grandparents on his father’s side were both from Barbados, belonging to the Springer and Clarke families. 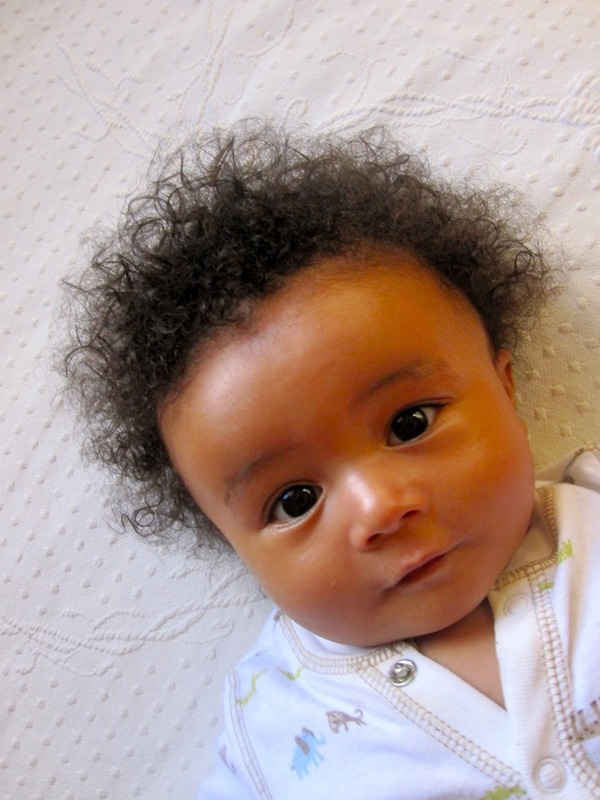 Everyone was shocked that I weighed over 10 lbs at birth but maybe it has to do with genetics. My Grandma Camilla weighed over 13 lbs. People say that I resemble her and my Mommy. I know she is watching me from heaven. P.S. I am a rolling machine. February 1, 2011 – While trying to get my toes in my mouth this morning, I figured out how to roll from my back to my front. I have been trying to master this milestone for a couple weeks already. I stayed home today with Daddy while Mommy and Grandma went shopping in Holetown. They bought a new bottle for me that has handles as I am determined to hold my own “tea” but the glass bottles are too heavy. I also got a new teething toy. I have drool down to my belly button at any given time these days. Daddy tries to make me wear a bib all the time – you know how fussy he is about clothes. 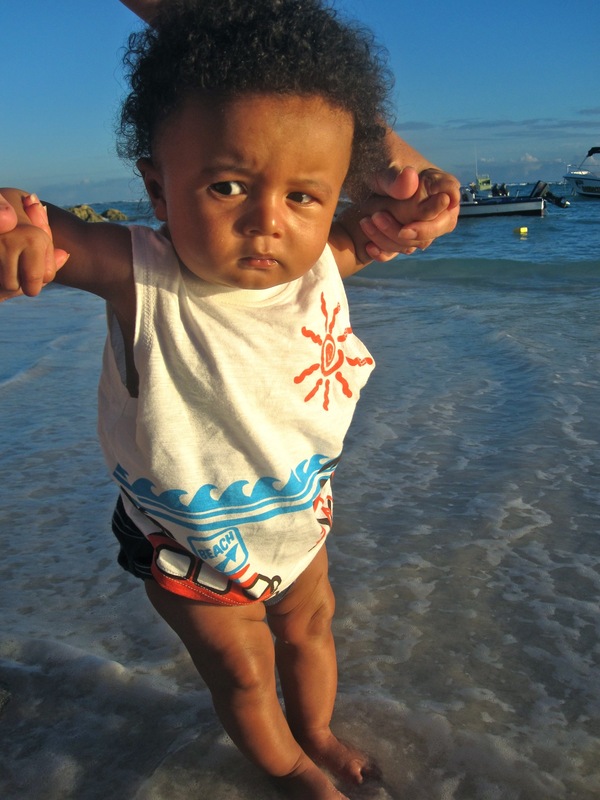 Mommy takes it off when he isn’t looking because it is just too hot here in Barbados. When Mommy was gone, I shared a sweet belly laugh with my Daddy – he is a funny guy after all. Mommy was sad she missed it. This evening I sat in Daddy’s arms on the edge of the track at the Garrison and cheered on Mommy and Auntie Alison. Mommy walked four miles and even ran a bit. She said my little face was the best motivation ever – so I laughed out loud one more time for her when we stopped at Grandma’s for a drink afterward. January 31, 2011 – Today I hung out at home for most of the day. I hate to admit it but I was a wee bit cranky. Mommy thinks it is because I get bored easily. I really enjoyed all the action yesterday. We went outside to admire the pretty flowers and banana tree. There is a big lizard in the garden just outside the door – we tried to spot him but were unsuccessful. Tonight Mommy went for a walk at the Garrison (the local horse racing track) while I waited in the car with Daddy. She liked watching the fireflies buzz around her. Afterward, we stopped by Uncle Alfred and Auntie Alison’s. They hadn’t seen me for a few days and were surprised at how big I’ve gotten. They say I have a “manager’s belly”. In other words, I am big and strong from my goat’s milk. 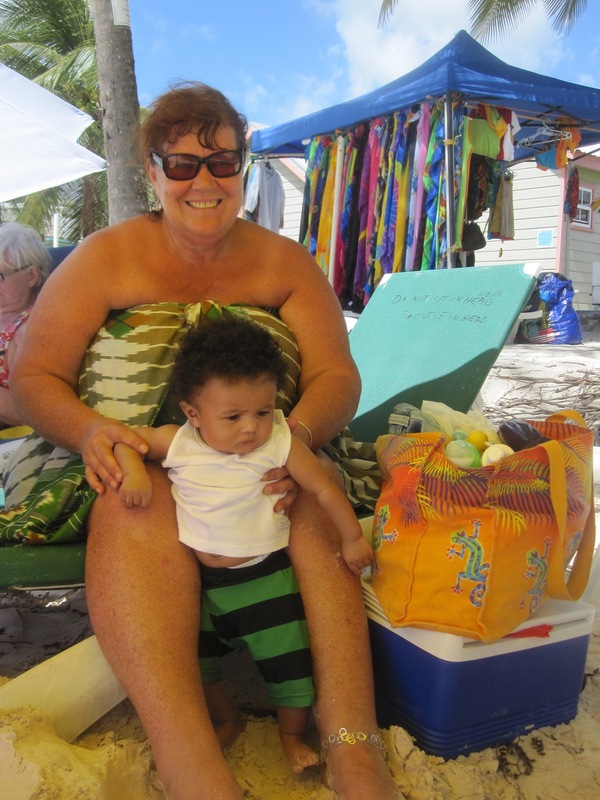 January 30, 2011 – Spent the day at Sandy Beach with Grandma and Mommy. I met a new friend named Liam. 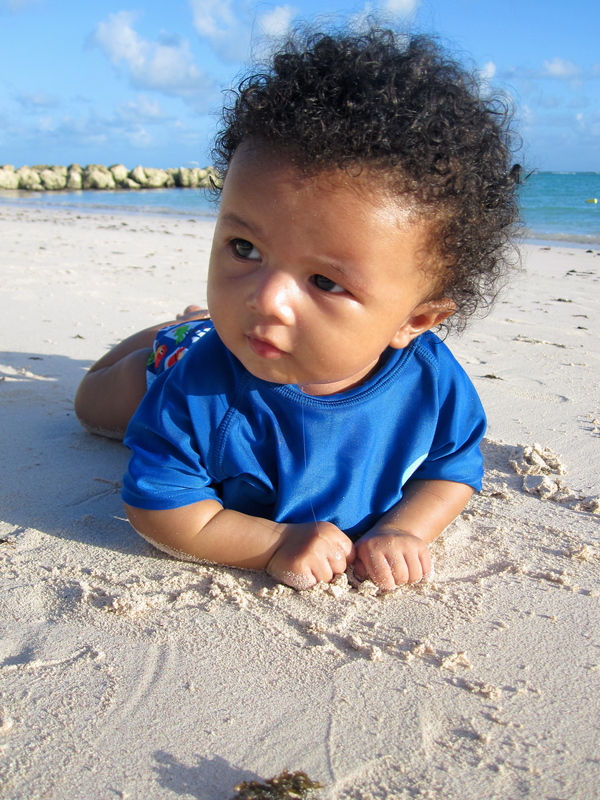 He is 10 weeks old and a local Bajan baby. His mom is from Wales. The beach boys made a fuss over me and assured me that I had lots of uncles on the island. I snuck in a few dances and was content to watch the world go by. Mommy worries that I will miss out on the beach culture growing up in Canada. There is truly something special about it. I was a happy boy. Daddy was working on a project at Uncle Alfred’s. We picked up supper in Oistens again. Had a bath and went to bed. January 29, 2011 – I woke up singing and played in bed for about 15 minutes before deciding I was ready to get up. It was a quiet day at home with Mommy. Daddy took Auntie Alison shoe shopping in town, came home for lunch and then headed to the dump to find something for his latest invention. January 28, 2011 – This morning I discovered my toes. Then I went to the beach with Grandma and Mommy. Just as I was going for my first swim at Sandy Beach, a turtle came right to the shoreline and stuck his head out of the water. It was like he was welcoming me into the sea. Turns out that I like feeling the sand between my toes but am not a huge fan of the water. Mommy got down on her hands and knees to take some photos of me – probably looked funny to see a grown woman rolling around in the sand. Daddy picked us up and we went to Pat’s Place in Oistens for supper. I had many admirers. One lady even fell down looking at me instead of where she was going. We saw some old friends. I got to see a mother chicken with her two babies wondering threw the crowd. It was a kodak moment but we didn’t have a camera. I also saw my first rat – it scared Mommy. January 27, 2011 – Stopped by Uncle Adrian’s on the way to town to meet Grandma. It was the first time Mommy met him too. He has beautiful dreadlocks. Like Daddy’s but longer. I love to play with Daddy’s hair – although I would really like to eat it. We went for a drive around the island to take photos. I slept in the car most of the day. We had to be back at Carlton’s supermarket to pick up goat’s milk. Tracking it down has become a regular challenge. I have also decided that I don’t particularly like my car seat and stiffen like a board when it is time to go for a ride. Great Uncle Keith also said to say “HI” to you and he’s enjoying all your pictures and activities. We haven’t had the chance to meet yet but I am sure we will soon. My life has been truly blessed to have met a kindred spirit like your mother and a kind, creative man like your father. You are a very lucky little man to have such beautiful people as your parents. I can tell already that you are going to be much the same. I am also very happy that your tummy is feeling much better. Mommy’s intuition is the best medicine out there! You keep telling her that, okay?